T – minus three weeks! Ok friends, start your countdown timers ’cause we’re setting the launch date for the June 11/12 weekend. Many self imposed deadlines have come and gone over the past four years, but today we can actually see the finish line. 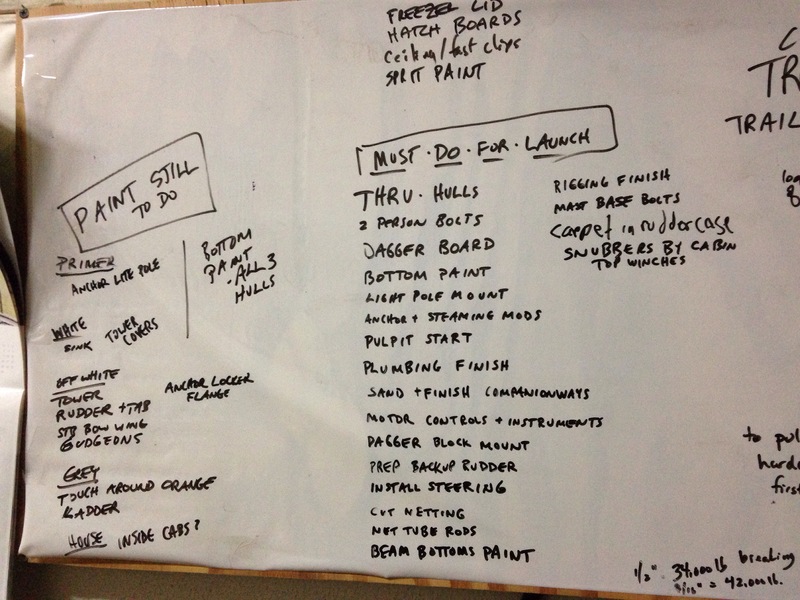 While y’all are grilling, drinking, riding, sailing, etc for Memorial Day weekend, we’ll be hitting this punch list hard. 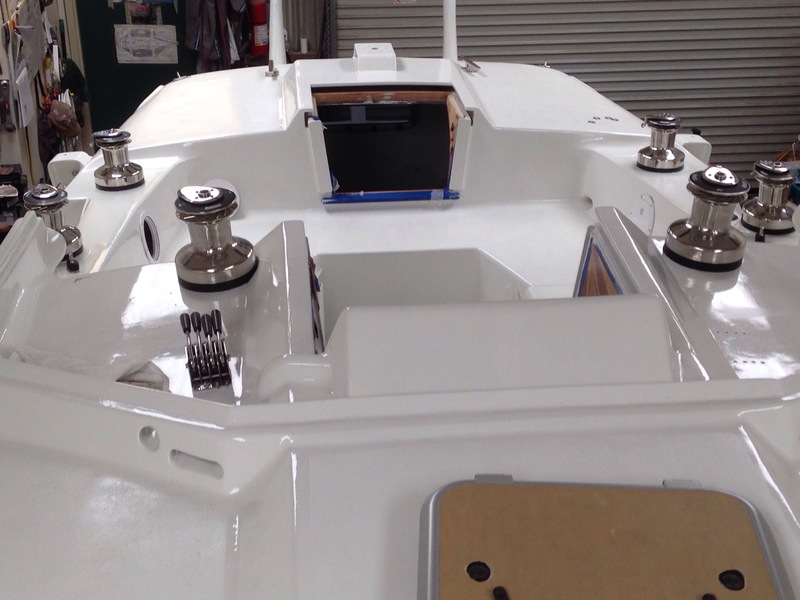 All deck hardware is just about buttoned up now. About an hour more of securing a few more bolts to go. 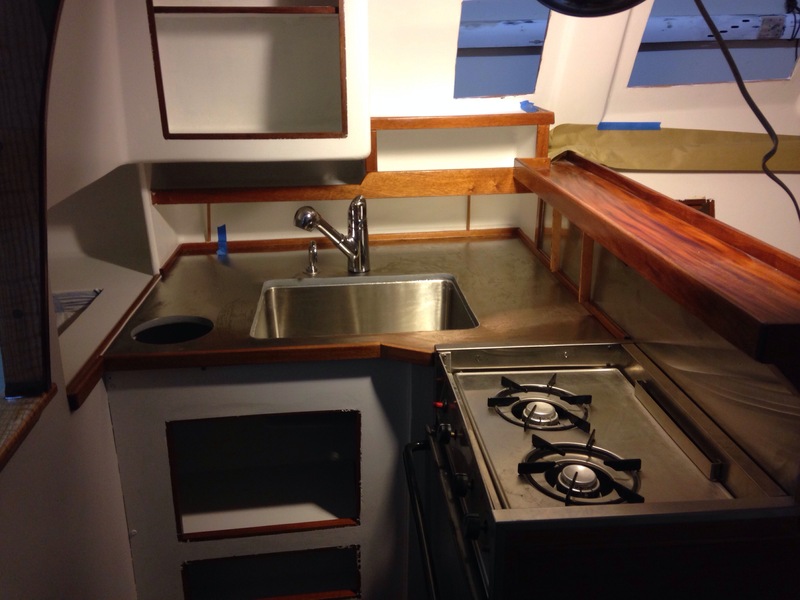 Ventilation should be good inside, with three deck hatches, the two companionways, a dorade up front, two opening ports in the main cabin, two in the bow, and three in the aft cabin. The all-stainless steel purchasing for sailing hardware has Jeanne appreciating the “boat bling” look. All this stuff cost about like buying decent gold and diamonds, but hopefully the enjoyment per hour is well spent on the sea side of the equation. 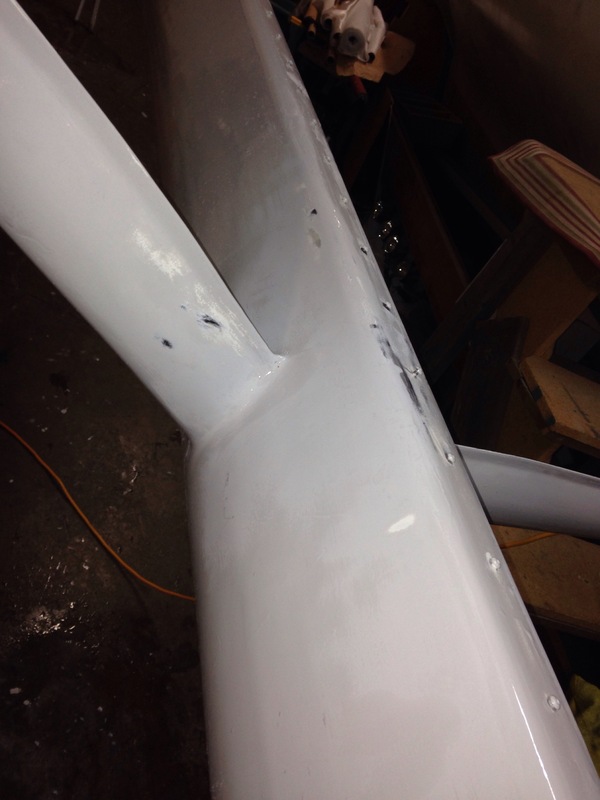 Last year we wrote about concerns of the captive-pin mast base, especially after seeing the same design as our mast’s step having cracked on the Contour34 tri. Recall the Keith at Skateaway set us up with a receiver cup at the bottom of the mast. 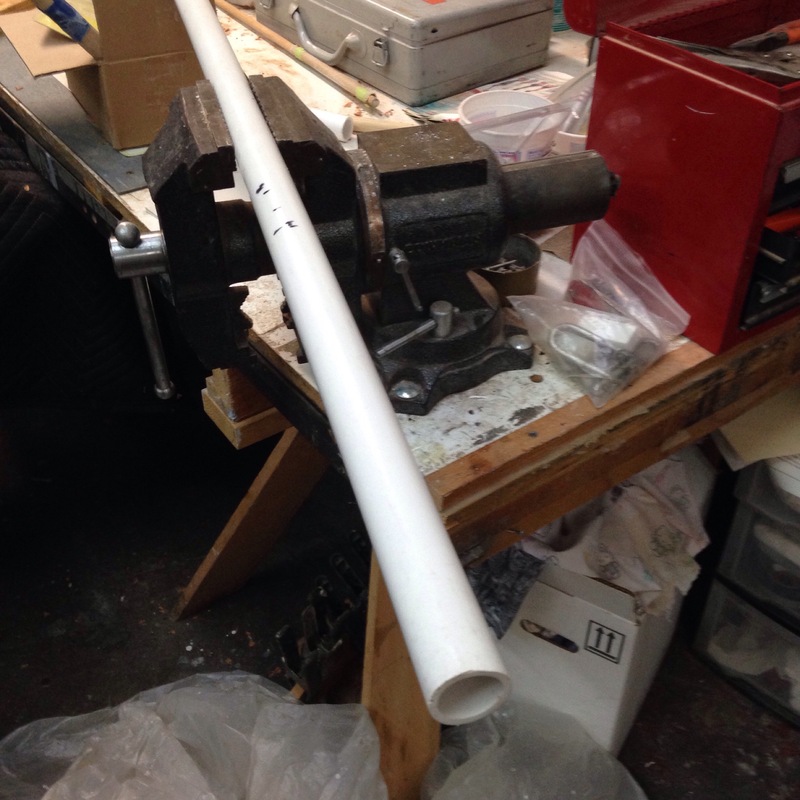 Yesterday we finally tackled designing and building a replacement mast step. Farrier’s F39 plan isn’t quite right because he has the halyards on either side of the receiver ball, while we built our mast for them to exit just aft of the ball. So we used Farrier’s load solving but did some shape changing. Things were a bit tricky because the deck slopes about seven degrees off level and we want the ball to sit close to level with the water. Here’s the one we’re replacing. Missing in the photo is a high density plastic insert carved with a cylinder to accept the round steel pin from the mast. 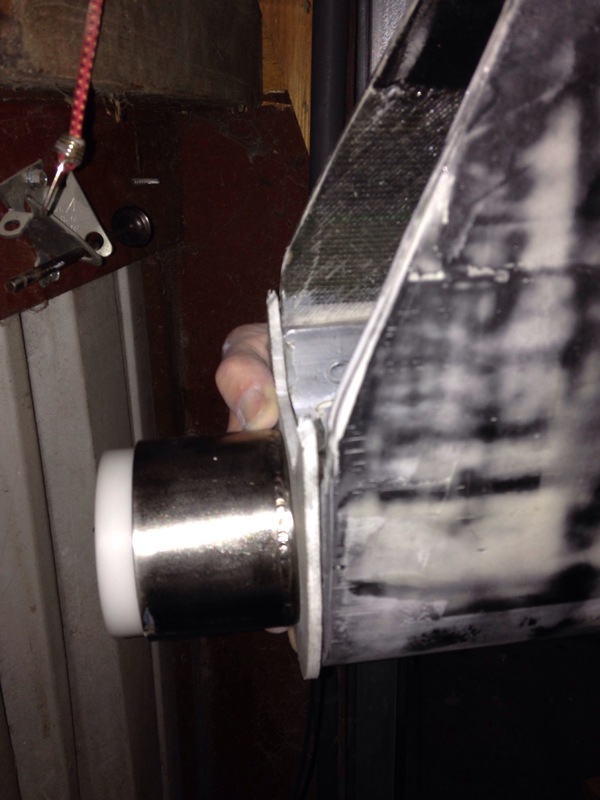 Note the old piece is stainless steel. So first on paper, then mocked up in wood. 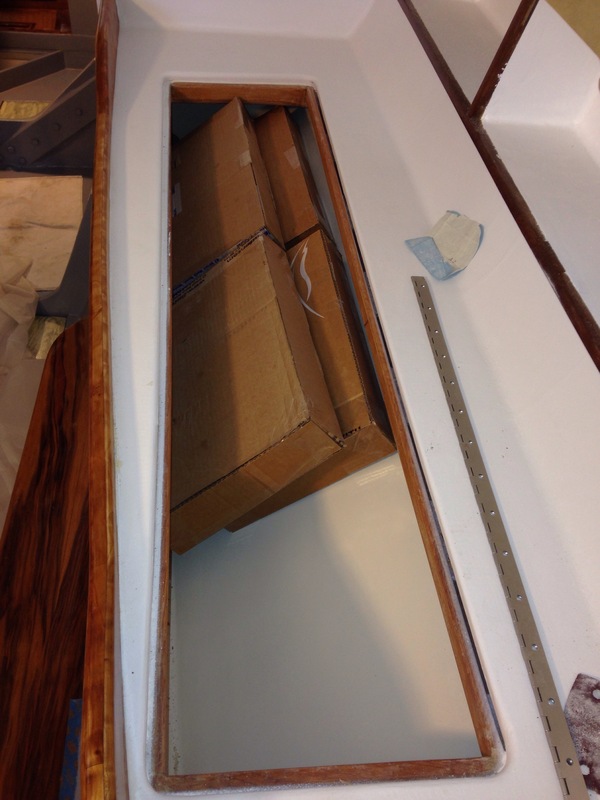 The plywood chunk at the left represents the deck slope. 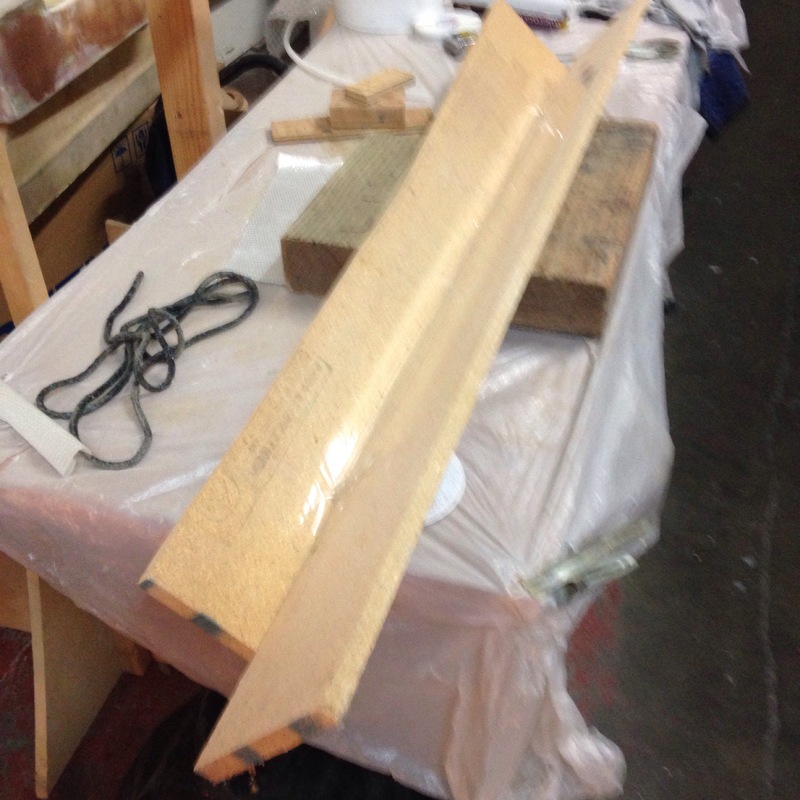 Next was sharp blades on the chop saw and table saw to cut shapes and make the 7 degree bevels needed. Ouch, $125 for about 2-1/2 sq feet of 1/2″ and 3/8″ 6061 aluminum. 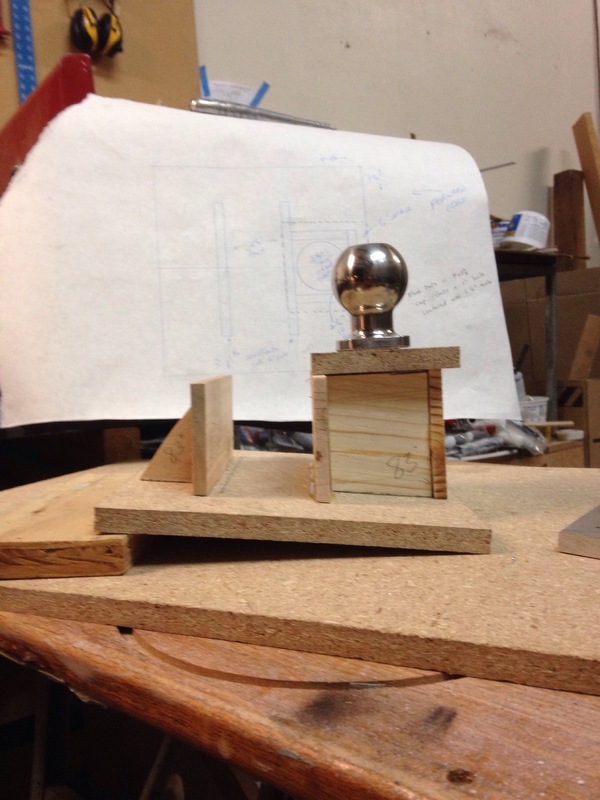 Took about three hours last night to cut and sand/grind everything in prep for the welder this evening. 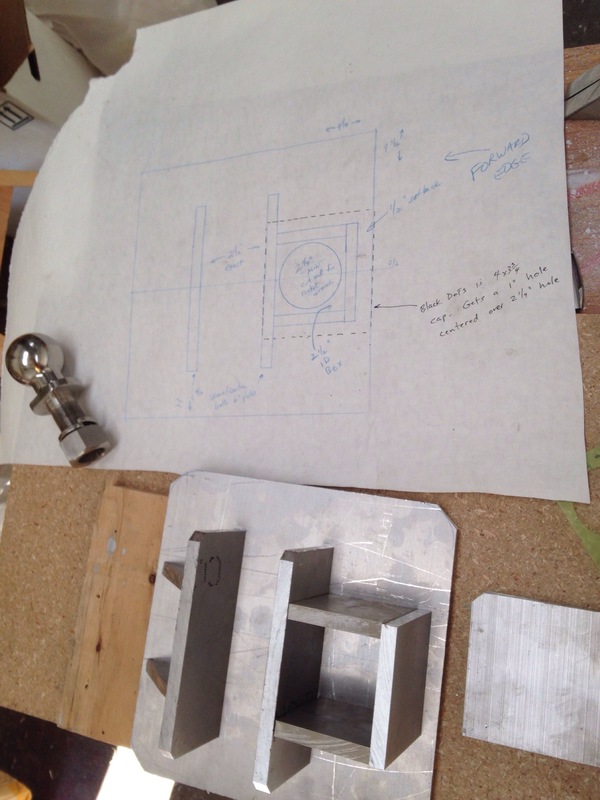 The welding shop was happy to get things properly prepped, with 1:1 scale drawing and a wood go-by mockup. 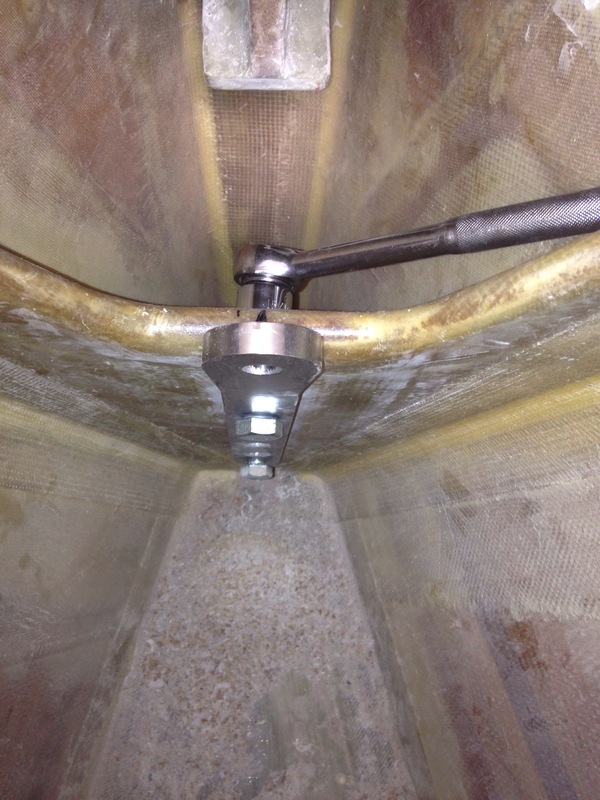 We had left the proper 1/4″ fillet weld spaces at the seams – overall not bad for first time amateurs. Then the casually noted, yea we can do this in two hours; that’ll be $280, sir. After that it’s a stop at the anodizer, and this will be a $500+ part even though we designed it and cut it all out. Geez. 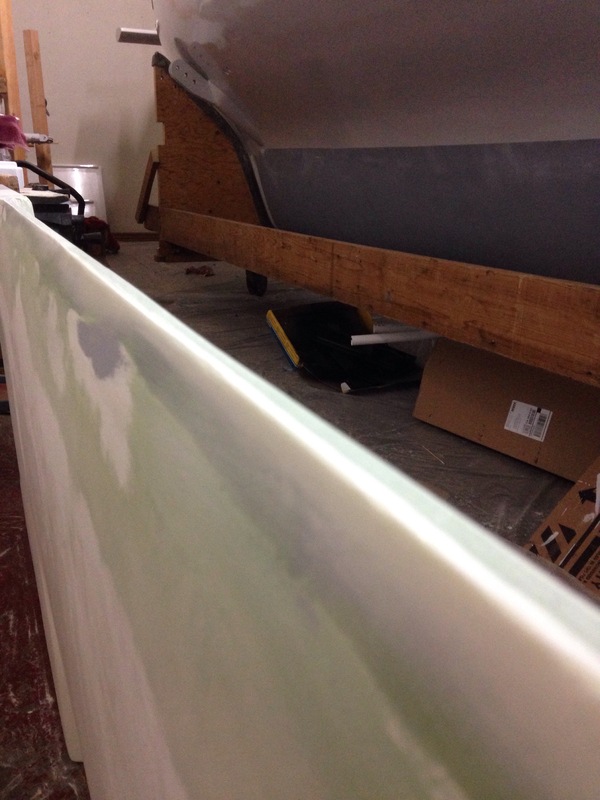 The bottom paint isn’t on yet because the thru hulls aren’t installed because one had to be special ordered from Forespar, etc (see how this works? 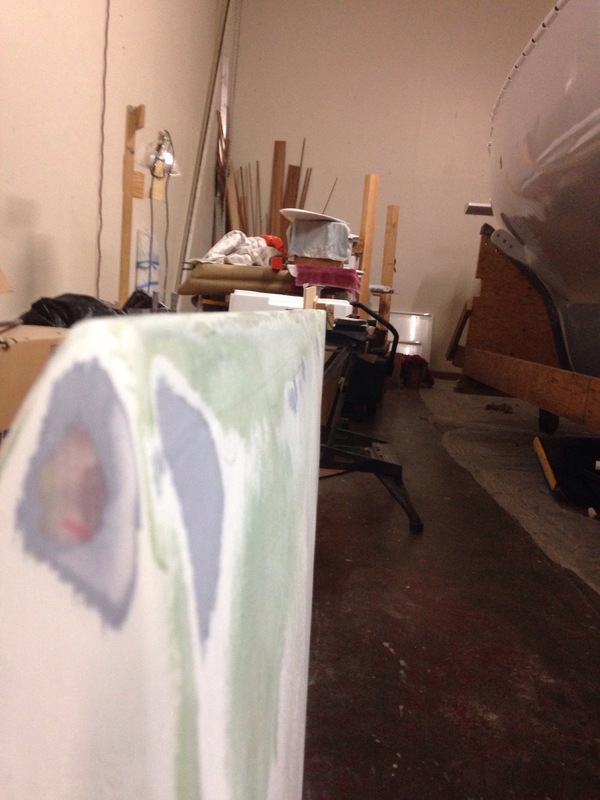 ), and we don’t want to mix up bottom paint until the daggerboard is also prepped. Last winter recall the America’s Cup foils building vet Cozmo pointed out the flaws in my dagger leading edge (“you know that sag will be slow, Carter” has been haunting for months ). He instructed on setting up a straight edge and re-fairing. Here goes: first see the problem gap. next we filled that void. 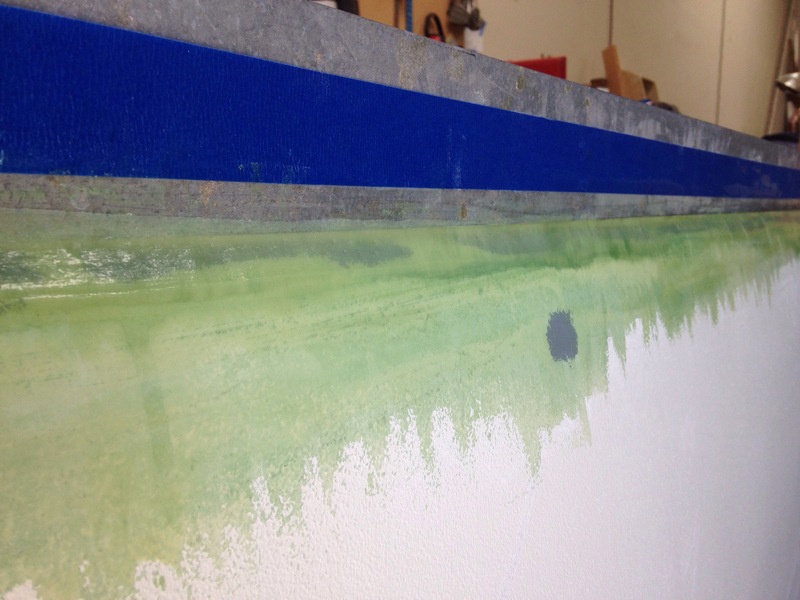 And got the leading edge of the board back to a straight line up and down. 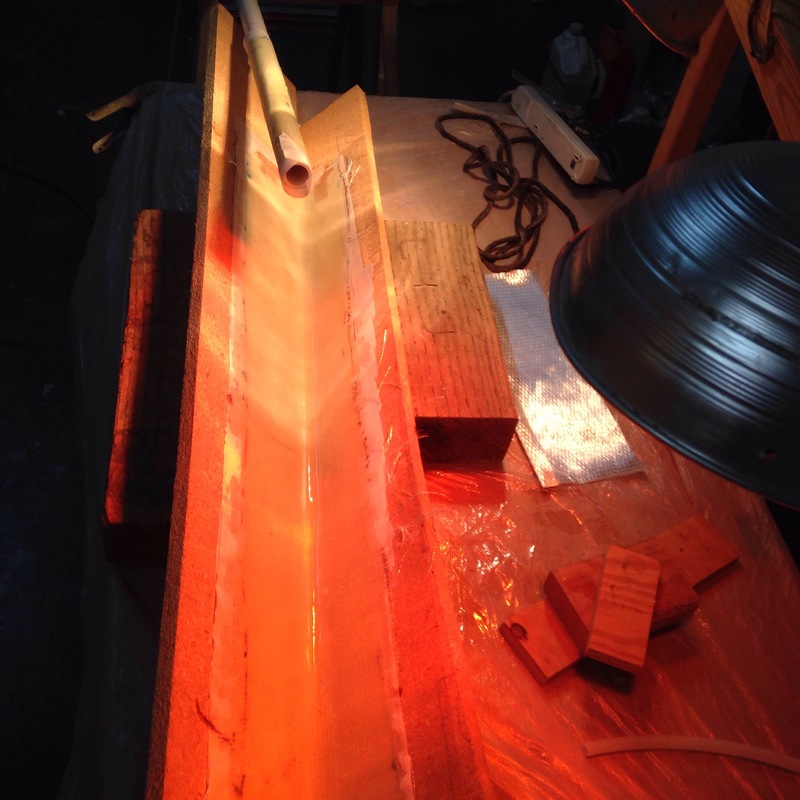 A quick phone call with the foil master tonight confirmed the next step is to make a careful wooden shaping jig cut from a proper foil leading edge shape (have that shape in the Farrier full size plans). 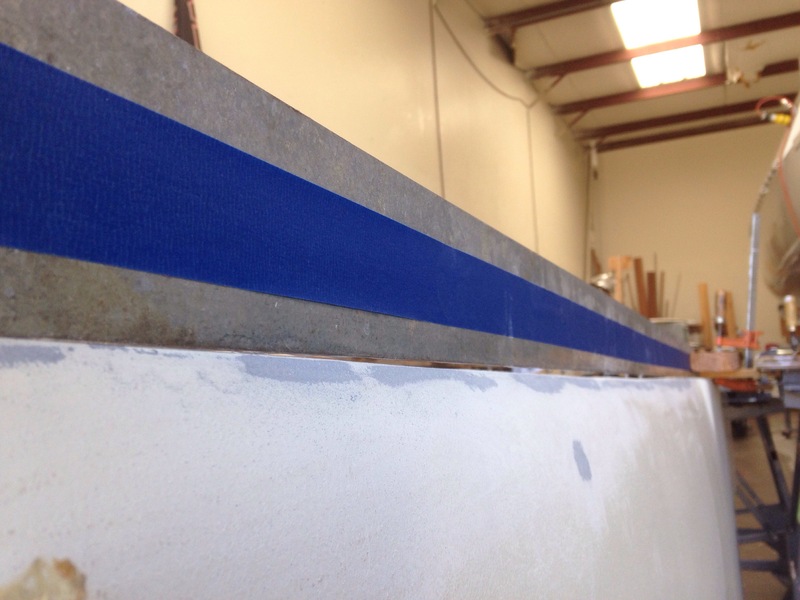 He said we only need to worry about getting the right leading edge rounding, and a properly symmetric first three or so inches shape flowing back. 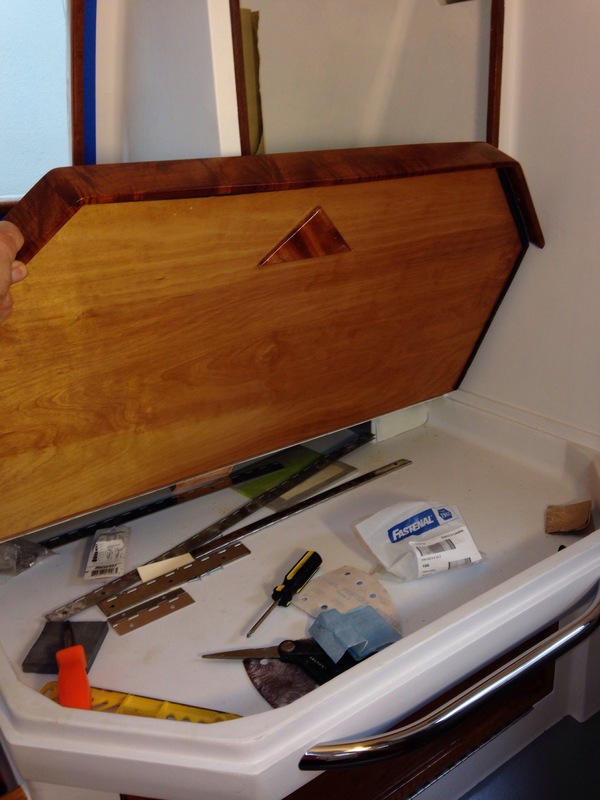 So the jig can be short-legged, not pulled all the way down these very large daggerboard sides. A few more hours this week to go. All the hardware backing plates are pretty woods inside – more photos next time- but anything outside is plastics. 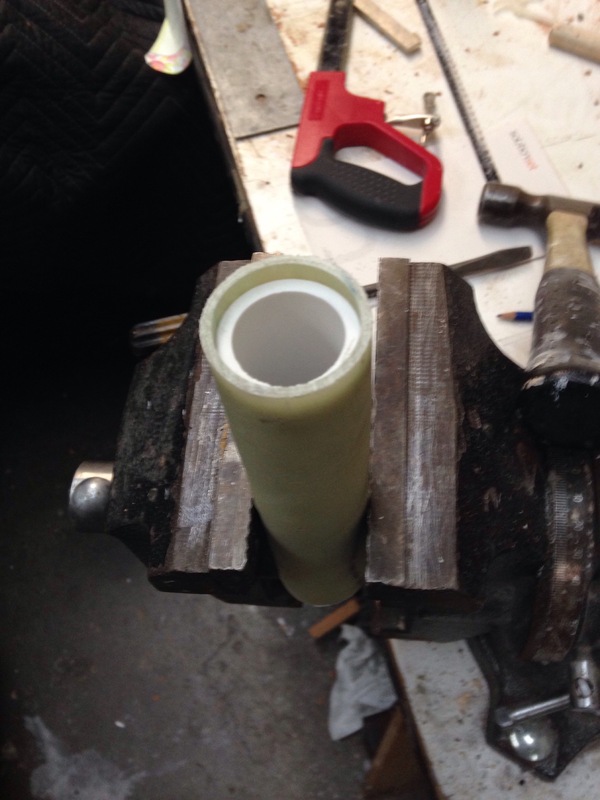 This 3/4″ high density stock from Tap machines very easily to make spacers under the rope clutches. This is the stuff we’re doing each evening now as the push to finish the list heats up. Very excited for Saturday when Jeanne and Leslie measure all the seating areas and map out the cushion foam we’ve been squirreling away for a couple years :). Curtains begin this week too. Yea! 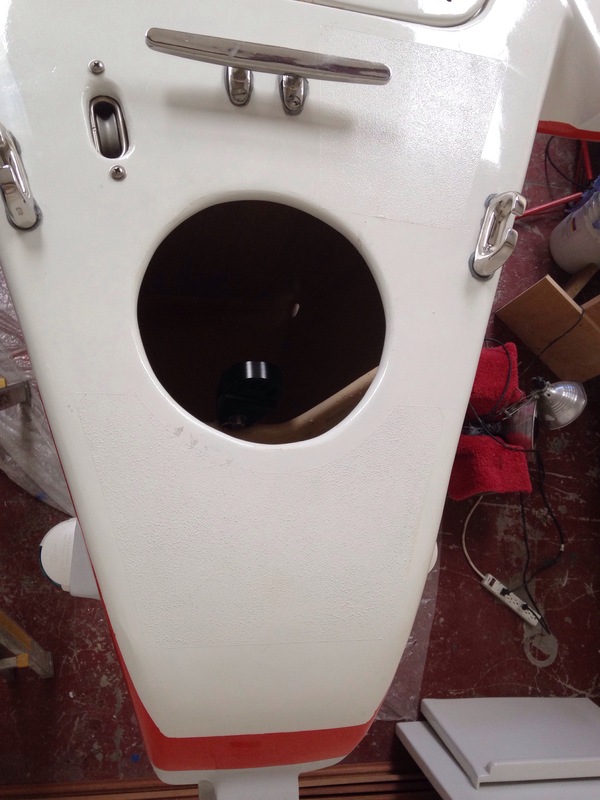 Along with sailing and docking hardware, we have four hatches to install. 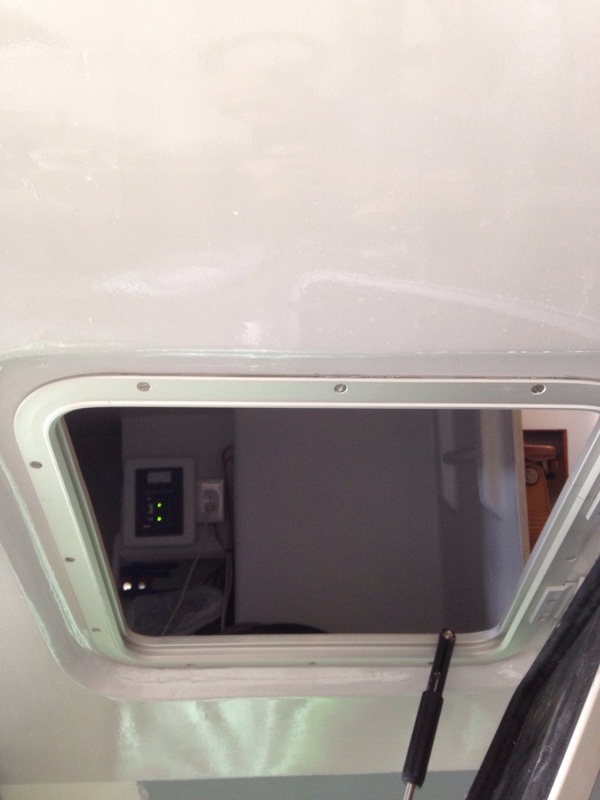 Here’s the escape hatch under the starboard aft beam. See how close to the waterline that is? Our intent is to NEVER use it as an emergency escape, but frequently make easy loading of groceries from the dinghy in exotic anchorages! 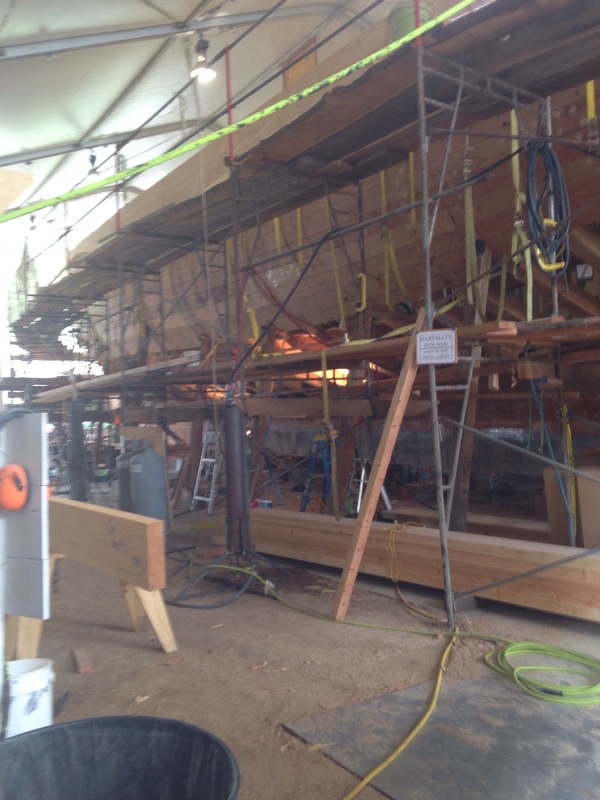 We took a recent drive to Sausalito and stopped in for progress on the Matthew Turner – being – built – tall ship (that’s probably enough for googling). The timeline has been roughly parallel with our build, but their scale is immense. If you drive through Marin, this is a must see! 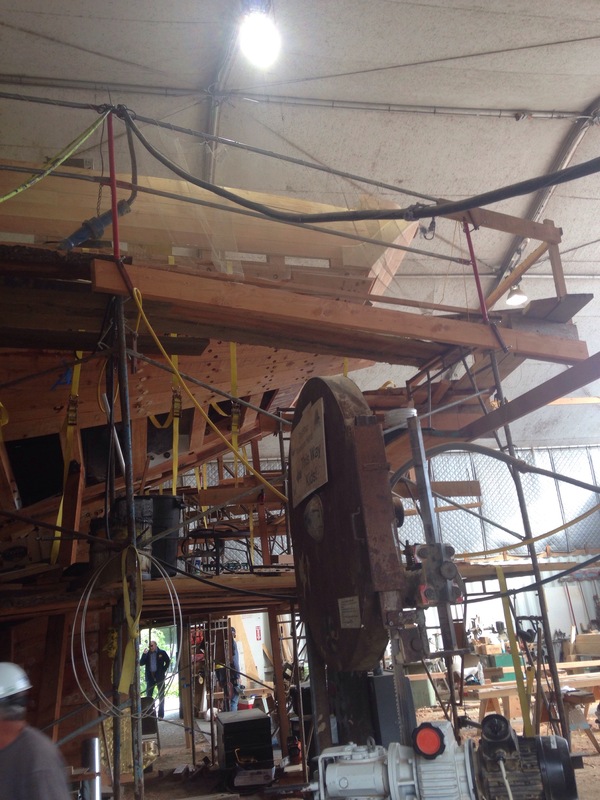 This 100’+ sailboat is being constructed from local timber. 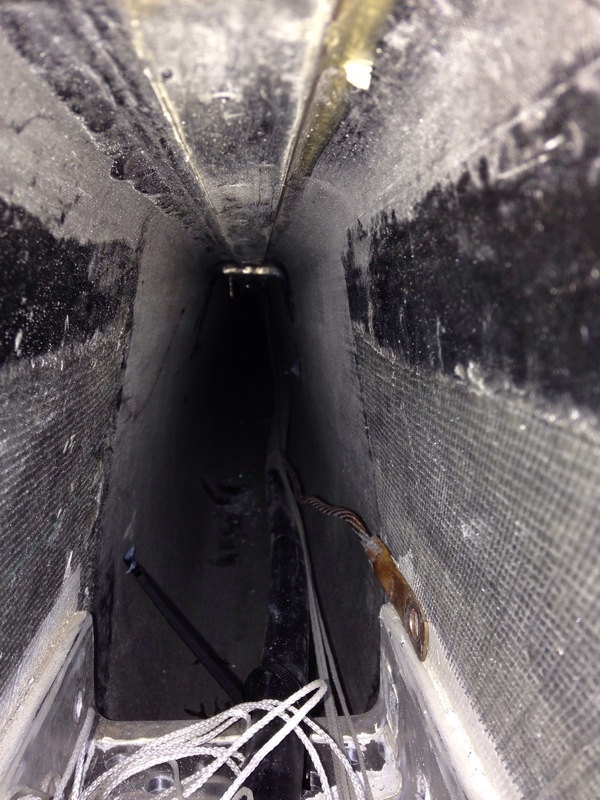 Here we’re drawing the long end of the line through the splice hole to really lock in the no-slip feature. 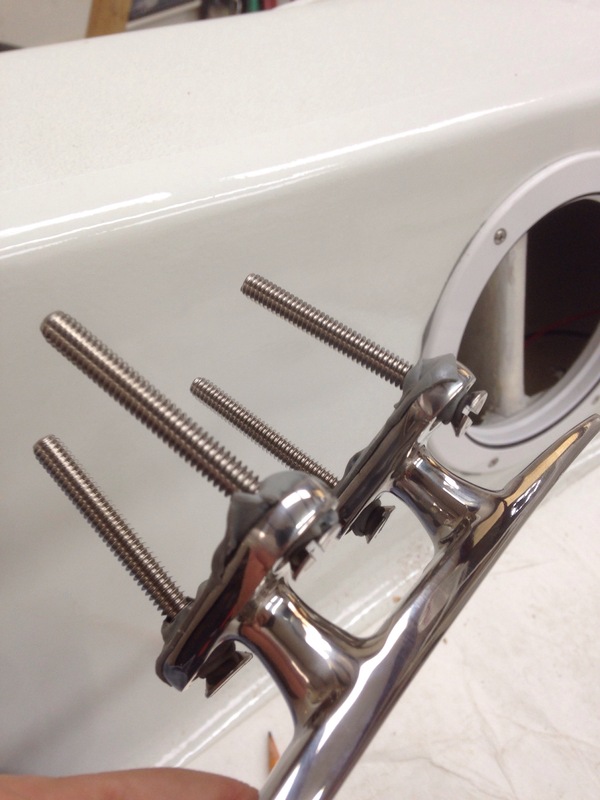 I hadn’t known that trick and now feel much better about my halyard shackles holding for life. 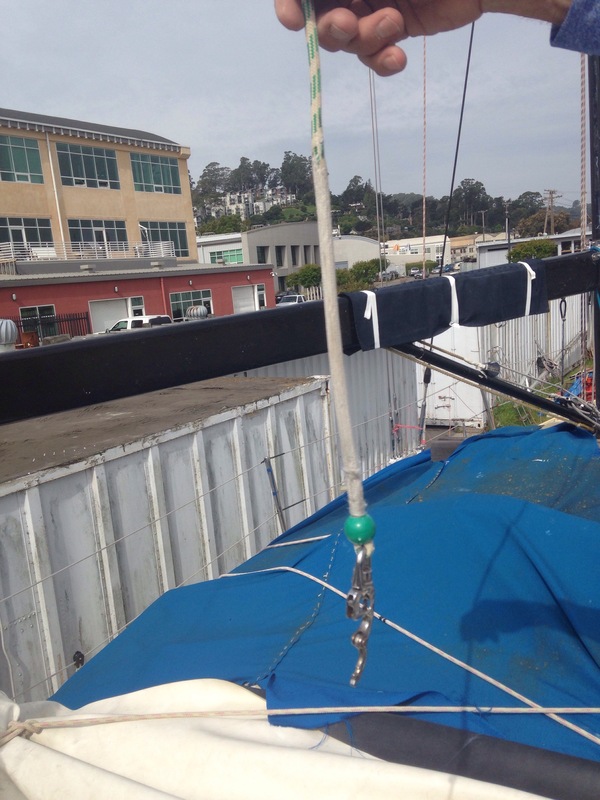 Charlie and I each also ordered some spectra cover material so we can protect halyards near the shackle ends – the far end of this light colored cover is frayed and buried in to the cover of the halyard line. 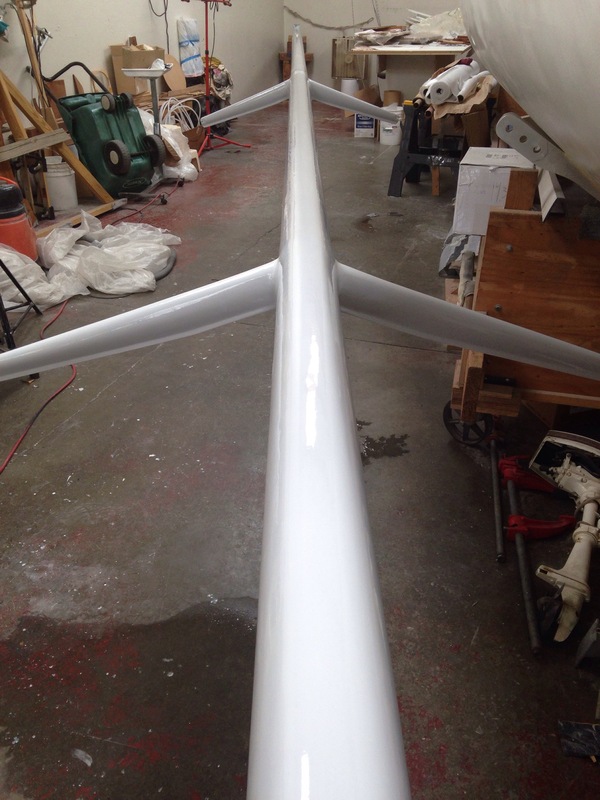 Tedious job but a great result, especially for a spinnaker or reacher deployed for days on the ocean. We listen carefully to everything this guy says, except that he was a little embarrassed by the results of this year’s Vallejo 1-2. Yea, he bulleted both days. Again. 75 miles of racing with everybody to his stern, upwind both ways. Modest and damn good sailing. And one curious note from that session – Gordie is covering his dyneema lifelines with cheap-to-buy electricians cable shrink wrap. Definitely need to get the NON-glue version, and you can pick most any color you can think of. Very clever. Here’s coat #2 of 5, with the roller headed northbound by about 4″ :). 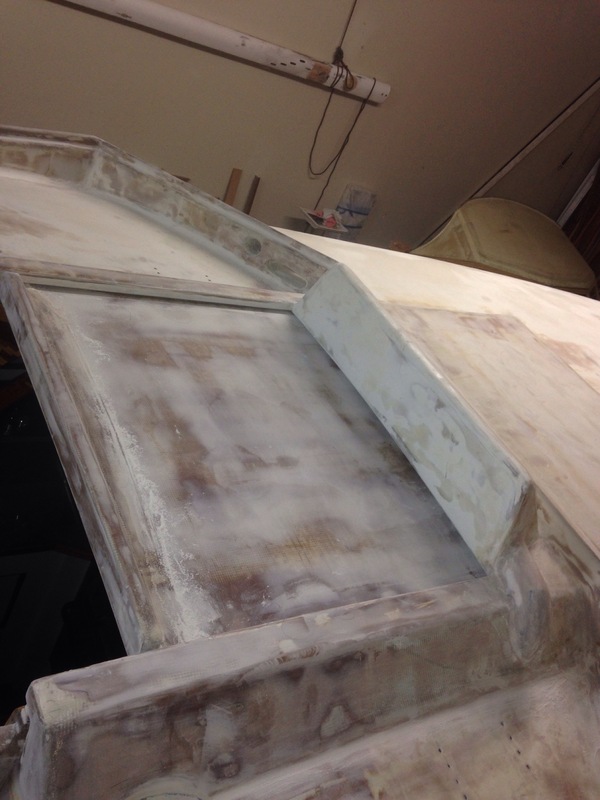 One more coat tonight and hopefully two tomorrow to finish this step. I pity you guys as this website is now literally watching paint dry! To keep busy in between bottom coats today we tackled final builds on the stern tower. 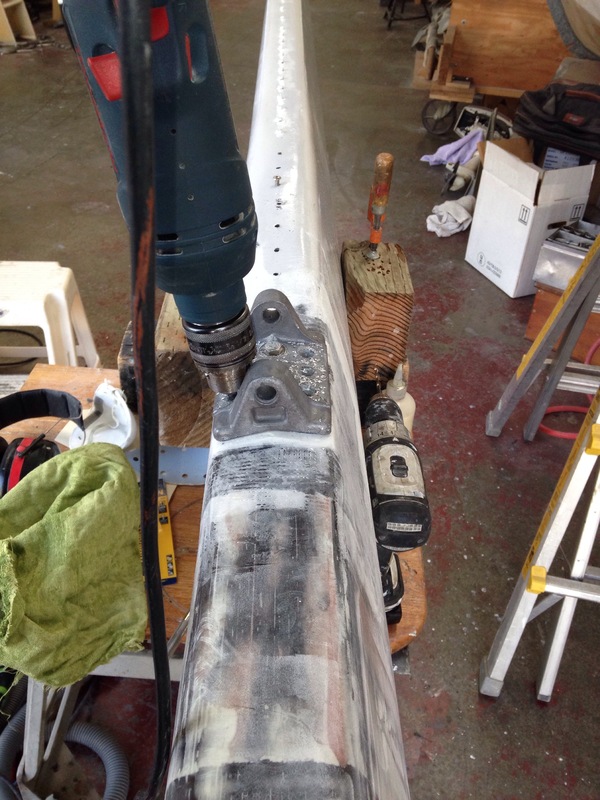 First is the little crane off the back to lift the rudder out of the water when stationary. If you look at older photos the top edge was purposely lower than the top of the tower. But overall this thing seemed too flexible and potentially weak. 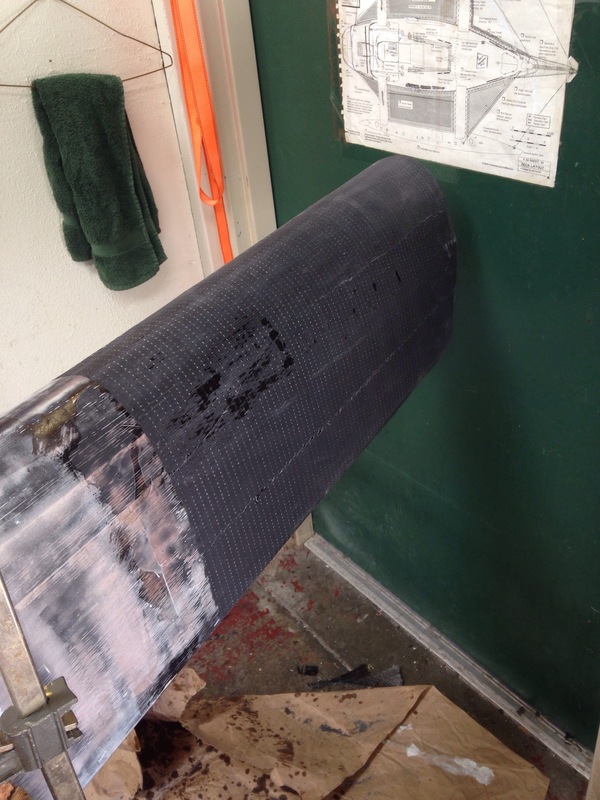 So it grew an extra foam core top, then more carbon ‘strapping’ wrapping over the top of the tower. Much stiffer now! 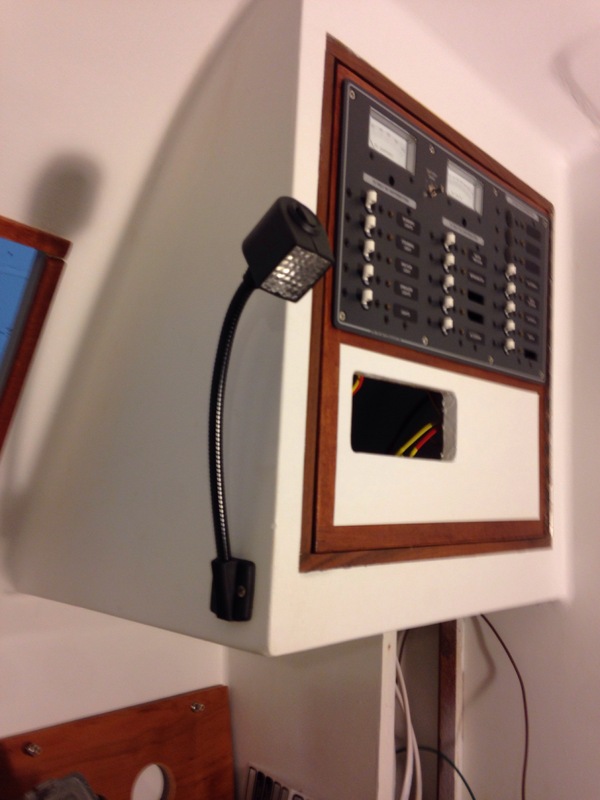 Next is the radar, to mount on the extra ‘ear’ of the tower to starboard. 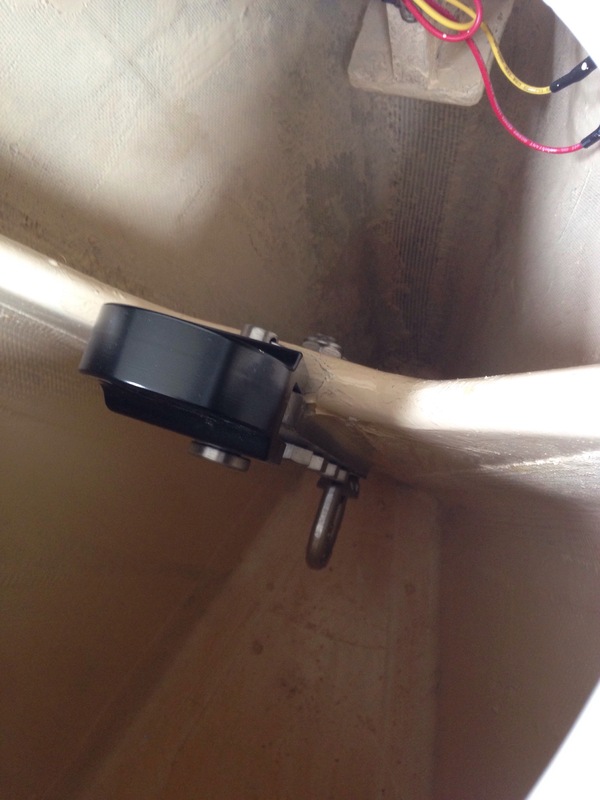 The mounting pattern of the Raymarine unit required some modification. 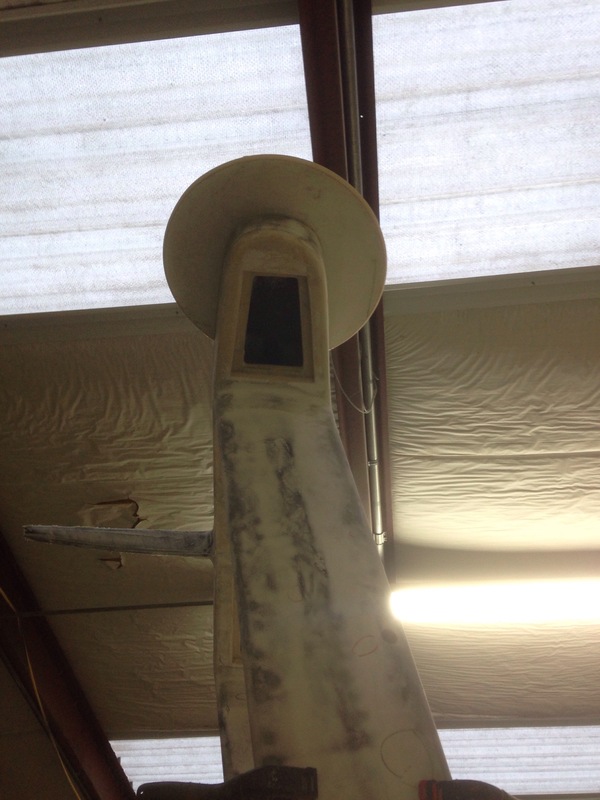 And since we’re not interested in a metal bracket, we made a fiberglass foam pizza instead. Last up is a shelf for the tiller pilot. 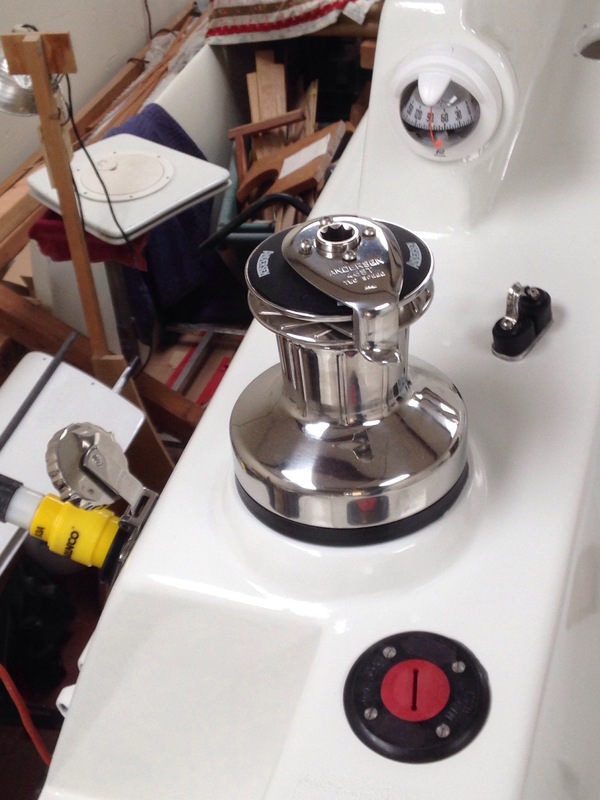 This location should allow us to attach the ram directly to the steering gear, or more intriguingly to a second set of cables to steer the trim tab on the rudder just as the windvane system will do. 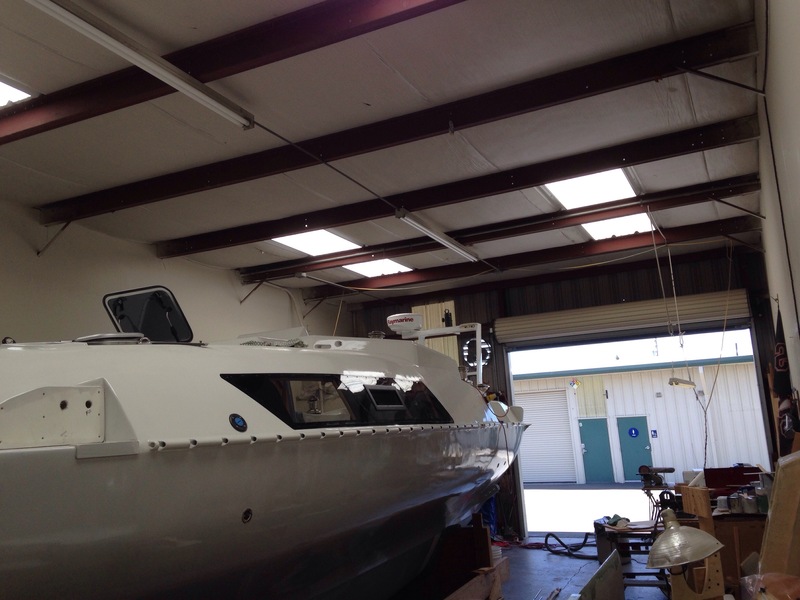 Much more on that story to come once we get to sea trials. 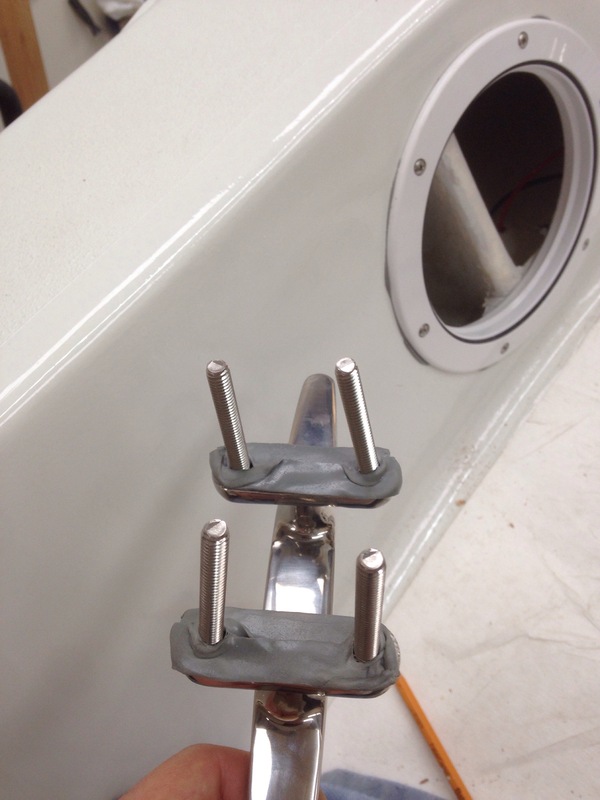 The diesel and water deck pass throughs are on the left, and the grey curve is a trial fit of PVC conduit that will carry the 110v shore power to the inlet on the right. The lazarette currently has the main cockpit drain entering and exiting its aft edge. 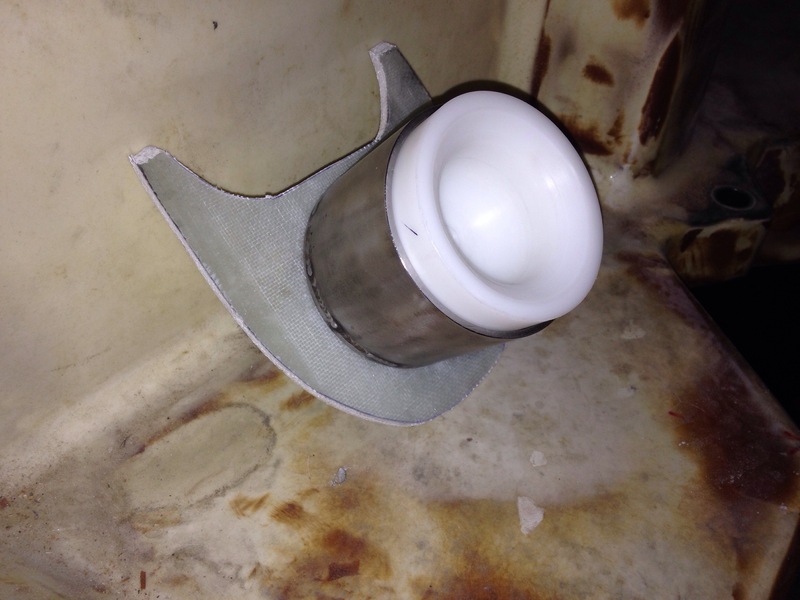 That needs a dedicated drain tube, especially since the propane well was added in this compartment. 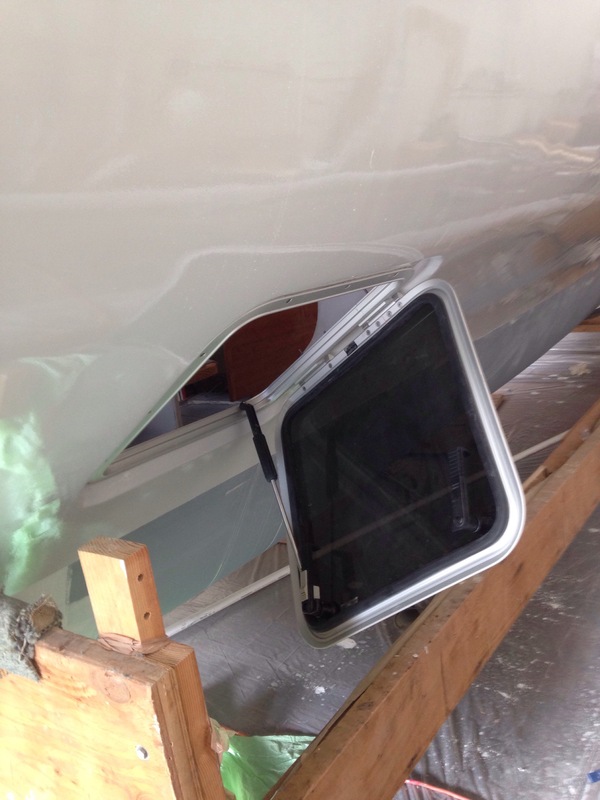 And there’s already a second overboard drain for the lazarette on its forward hull edge. So here’s a simple 90degree form with non-stick tape and peel ply laid in before the glass channel is made. And the new piece tabbed in place. 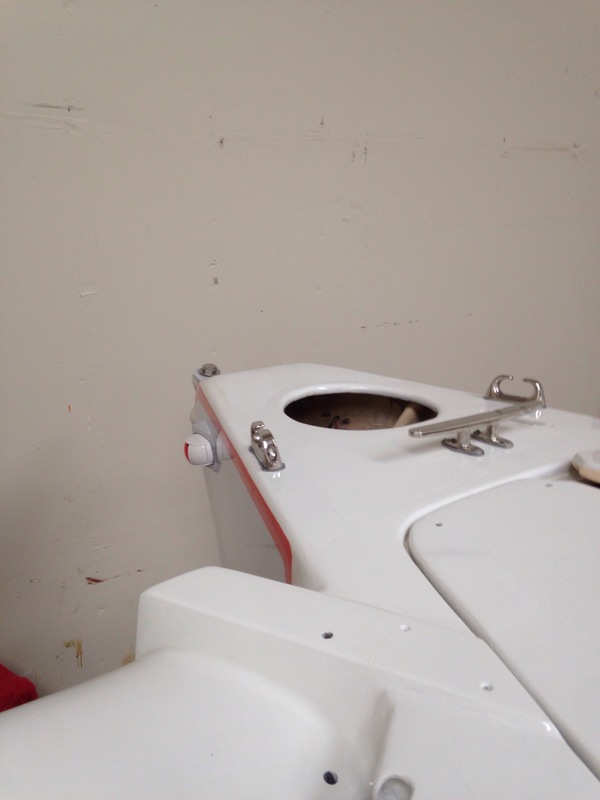 It looks like the diesel Espar heater will exhaust through the hull up high in this area so we’ll wait in placing the second half of the diesel and water filler pipe pass through tubes until the exhaust pipe is in place. Random segue over to wood finishes: we’re happy with the transparent non skid that was added to the sole (floorboard) panels a couple months back. 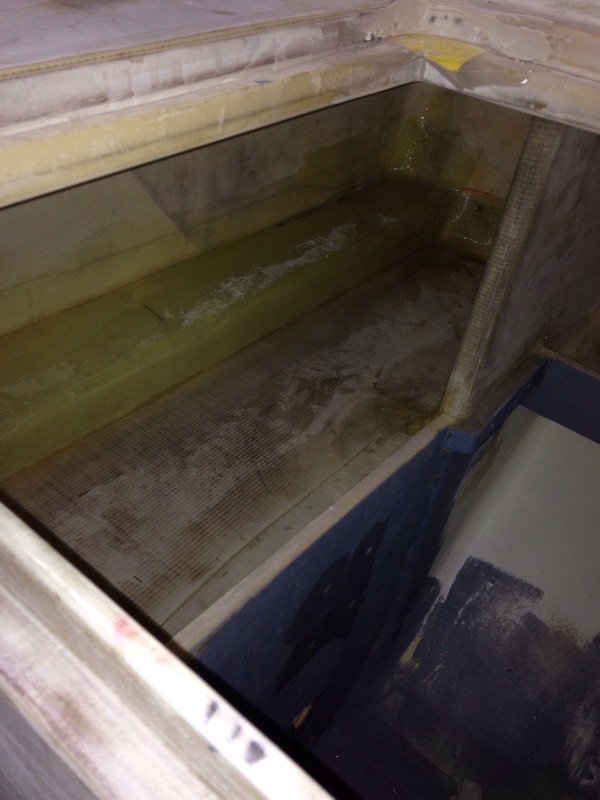 But that was added to a floor-finishers polyurethane that came out too yellow. 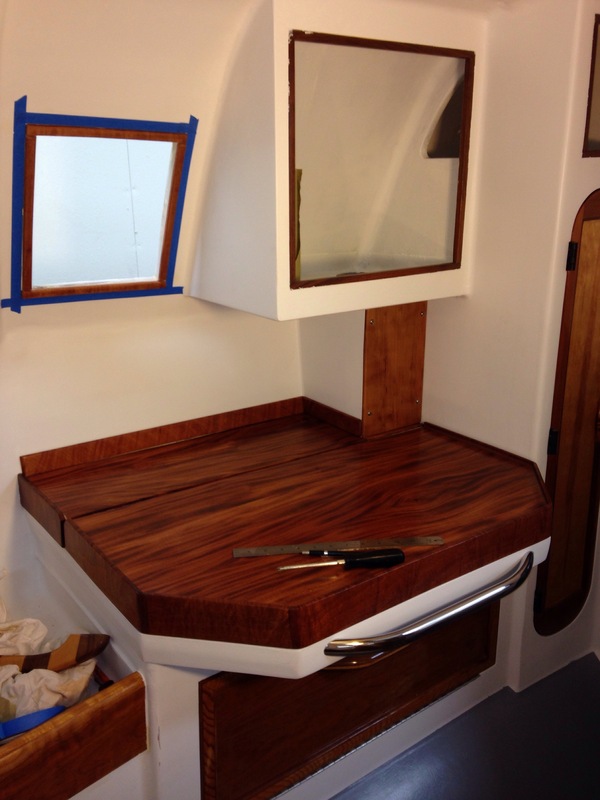 The companionway sills and steps needed non skid yet we don’t want to cover the woodwork with the standard tape. So here they are redone in Interlux Perfection topsides paint with zero pigment (labeled simply Clear) and a heavy dose of non skid powder. 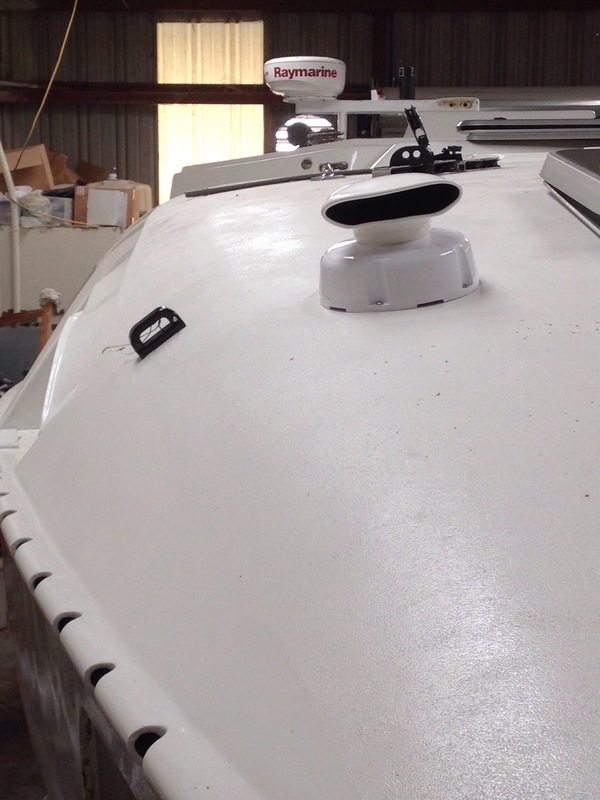 And while we await that big box of electrical parts, we’ve finished up cable runs and installed most of the cabin lights. 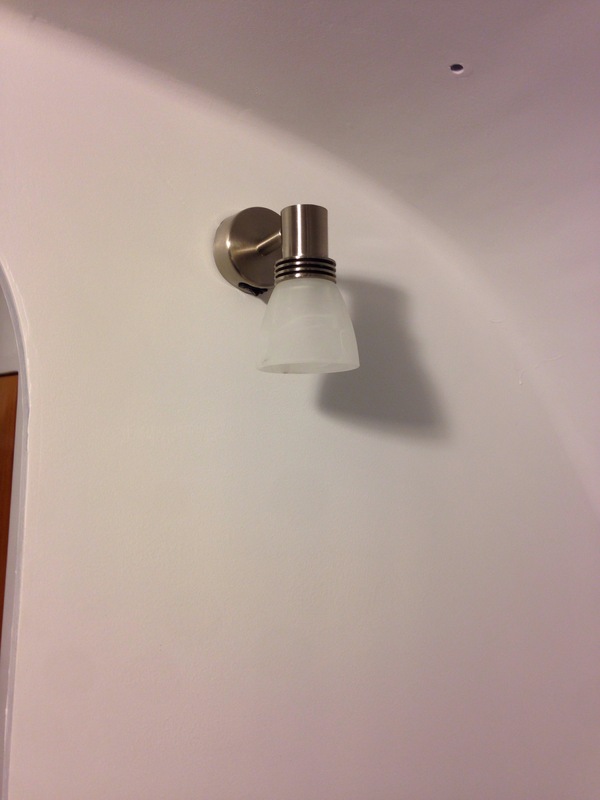 There are two halogen map lights, and everything else is LED. There’s a bit of angst about turning on all these lamps for the first time in place – really don’t want it to be the sterile, operating room blue-white look. The catalog copy and packaging has lots of “warm, soothing” descriptors but the old marketing hand here says “we’ll see”. Hopefully usps will deliver and we’ll dive in to 100’s of crimps and heat shrinks over the next few evenings. 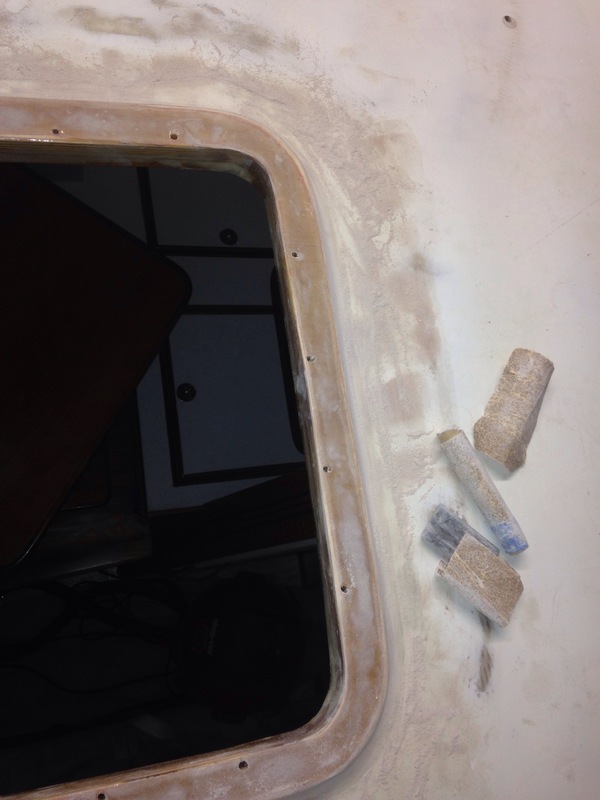 It occurred during the endless sanding tonight that maybe all the fairing work is what truly makes it the builder’s boat. The hands on every square inch of this 39′ beast, multiple times with big sanders, the “torture board”, hand sanding tools and finally just holding the damn paper until it gets too hot in your fingers. 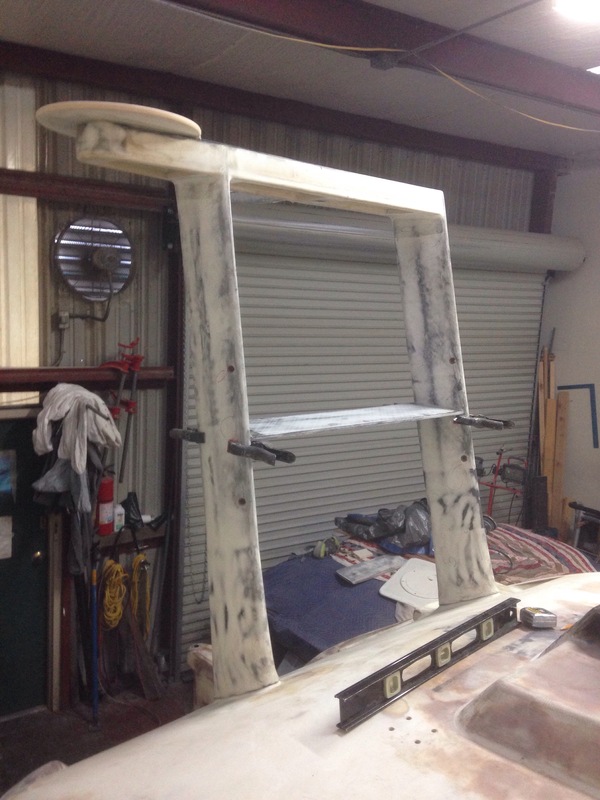 All the fiberglass, carbon and fancy epoxy buildups – now we sand that labor and money away. Could be frustrating, but instead tonight just maybe it’s more like sculpting – keep chipping away and we’ll find that pretty boat in the stone. 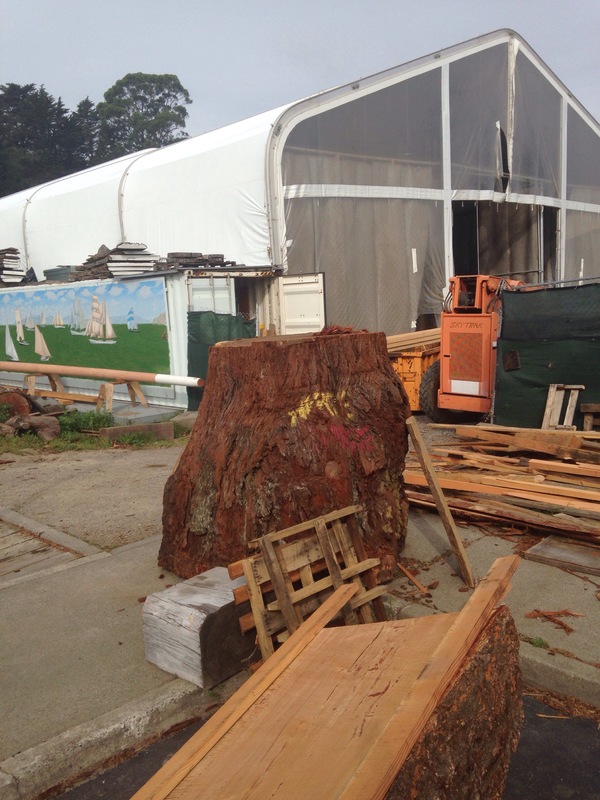 Lots of chipping away, to be clear! The deck area is close. Where other builders get it done in three fairing passes, we’ll apply coat #4 tomorrow to fix various blemishes and still unfair spots. Marking the blemishes with a pencil as soon as they’re spotted in sanding is a big help later. 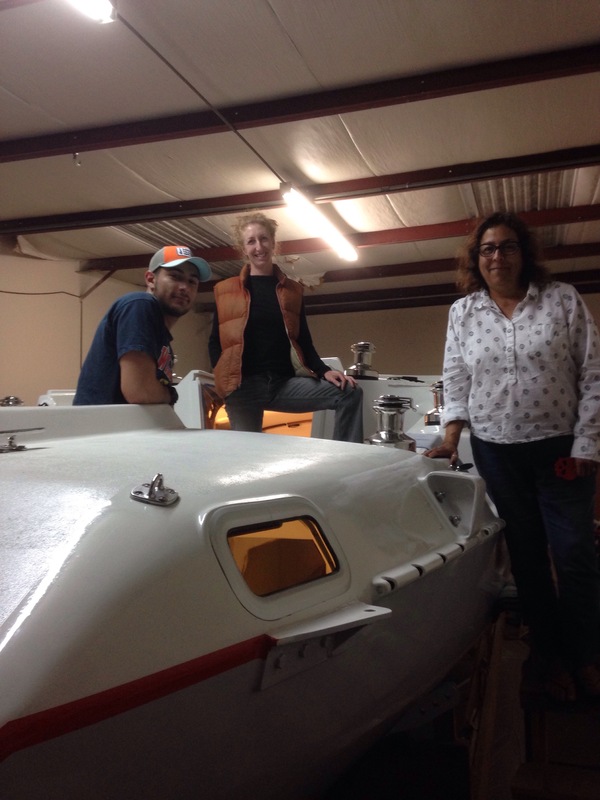 We’ve happily declared the interior complete enough to move back outside, finish all fairing and do the complete exterior paint job. Along with the video in the prior post, here are more interior details. There’s a lot of planning work behind the electrical system, particularly because we want to get the higher capacity / reduced weight and size of lithium batteries but not pay the $6-7k prices of pre-packaged marine lithium iron phosphates. The rise of battery cars is helping bring costs down for the DIY types. After a lot of digging plus advice from an experienced friend, we’re now shopping for four 3.6ish volt LiFePO4 cells with 400 amp hour capacity. These are dramatically smaller and lighter than a lead acid pack of 400amp hours. 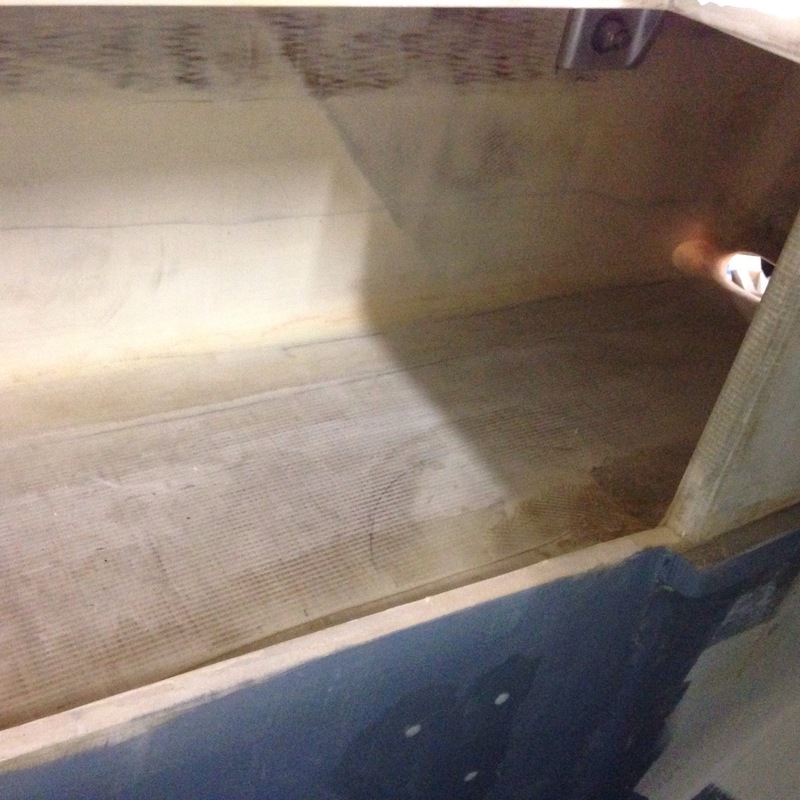 These cardboard mockups show them just fitting in a shallow locker under the sea berth / couch in the saloon, with room just aft for charging and switching equipment. 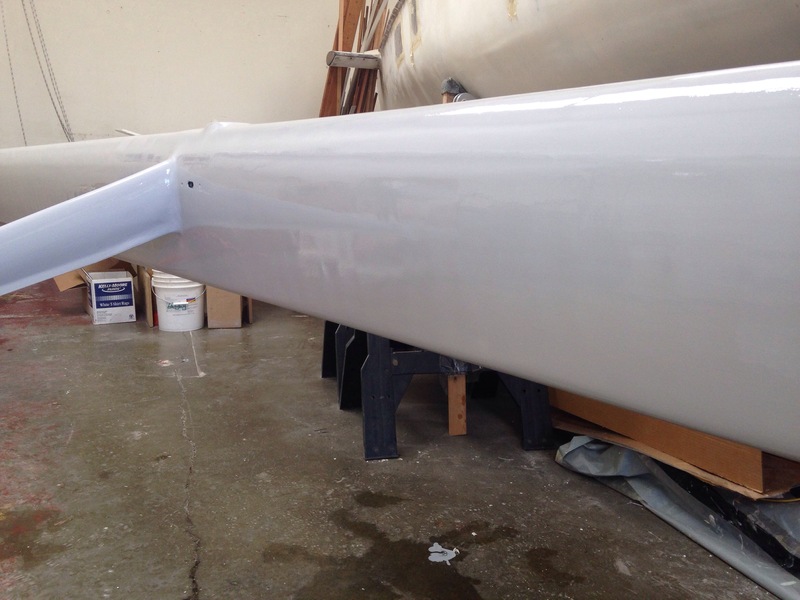 A lot of people on the Farrier trimarans discussion forum are interested in switching their Fboats to Lithiums so we’ll be chronicling the progress here with dedicated posts once more info comes through. 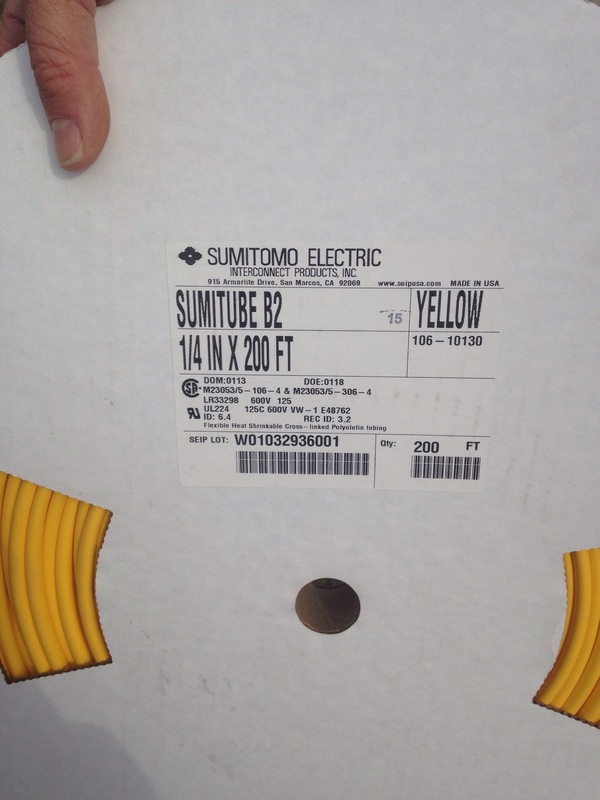 Right now the 400 amp size is hard to get from China. One firm is offering 700 amp hour cells for almost the same price, but they are too big for our spot. So we’ll keep digging. Meanwhile it’s sore arms from sanding the deck. 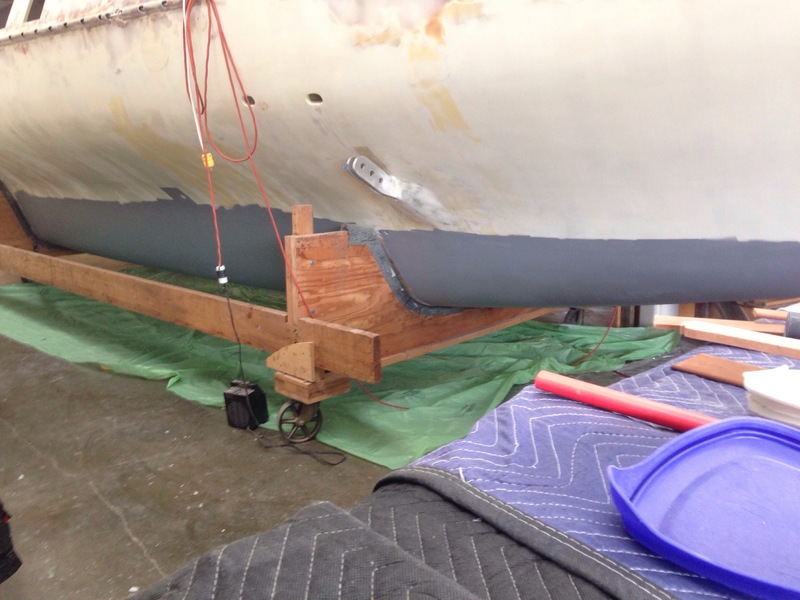 There are just a few spots needing final fairing compound skimming tomorrow, then we’ll progress to topsides. 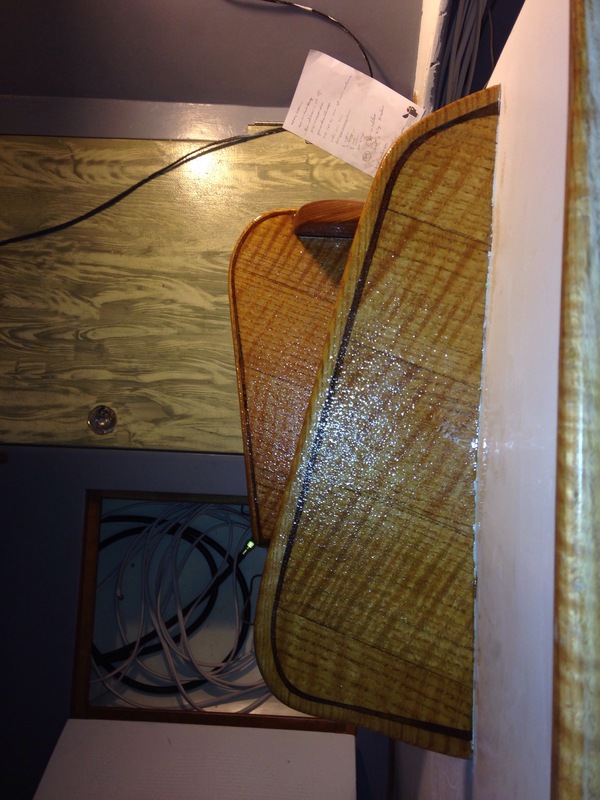 Even with $800+ in great sanding machines around, the back breaker always comes back to hand sanding. The curves around the hatches tonight are cause for tired hands. 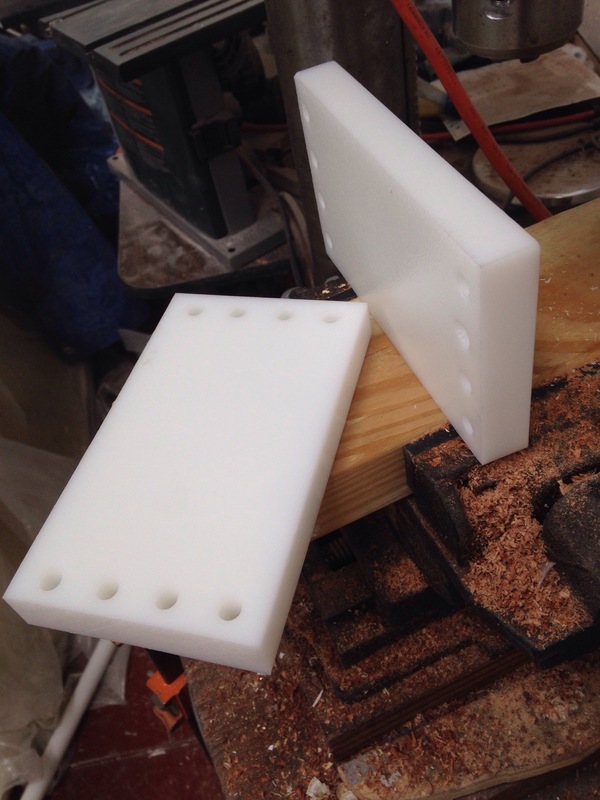 Making sanding blocks to fit non-linear surfaces may not seem necessary but has been a big help to get consistent results. 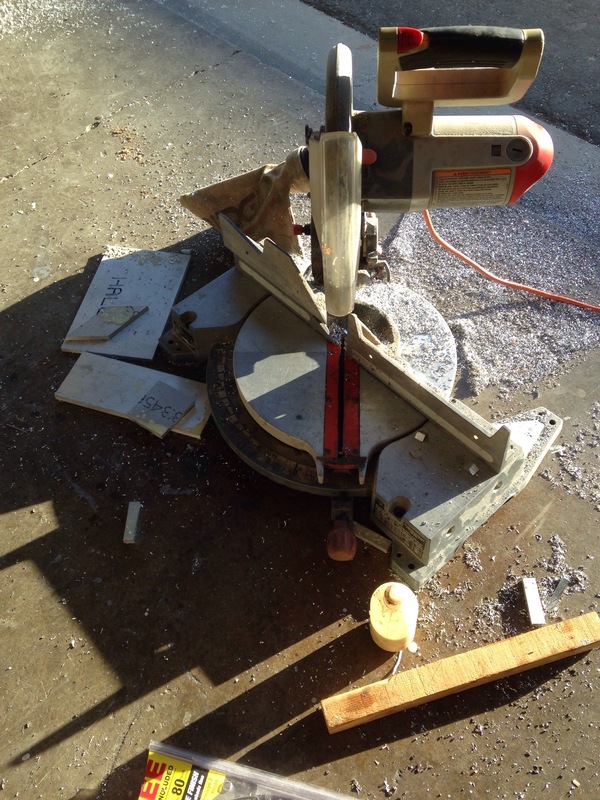 For example, having dowels the same size as the shaped trowels that make fillets yields clean sanded curves. 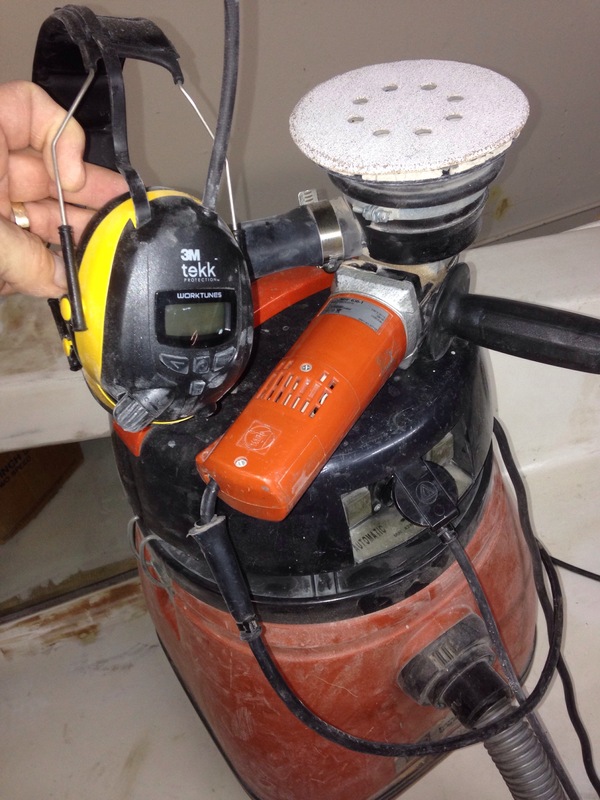 But for the 90% of sanding time the loud machines are running, perhaps the best tool is the FM/iPod ear safety covers. This is making the soul-sucking work of sanding a bit more bearable. Thanks Colin for leaving these with the shop! It’ll be great to get the ugly splotches all covered up soon with nice consistent primer paint! Congratulations to Griffin as he heads across I-80 to Univ of Northern Colorado. Your parents are very proud of your work and choices to start this next life step! 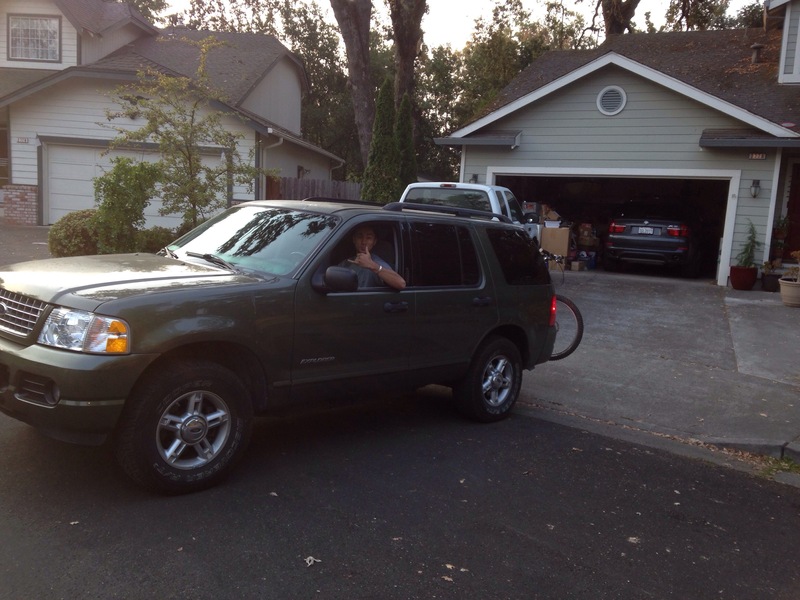 Jeanne is making the drive with him, and the house is eerily quiet today. 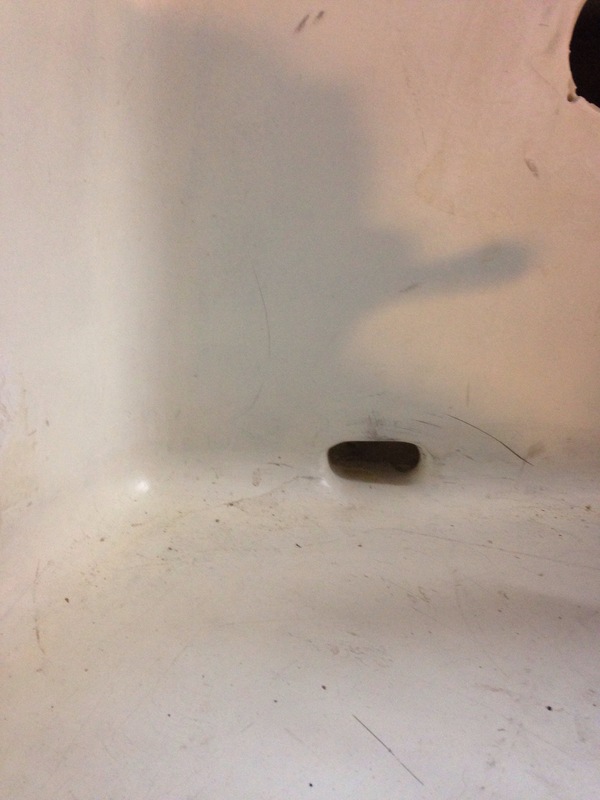 So the builder buried his head in the boat work today so as not to mope about the place. 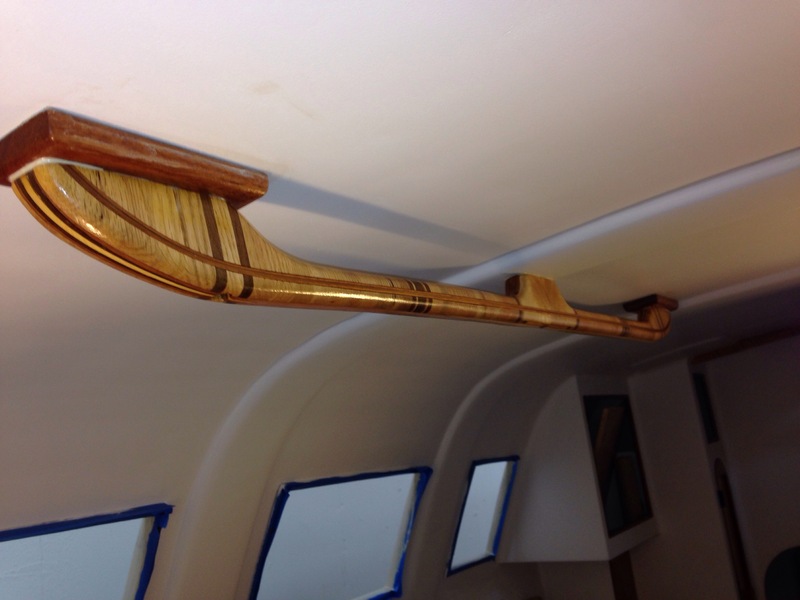 Last week we visited Dean Pederson’s place to see the custom 25′ Brown tri he’s preparing to launch (more on that when we get some photos); that boat has a lovely 35′ custom carbon mast. 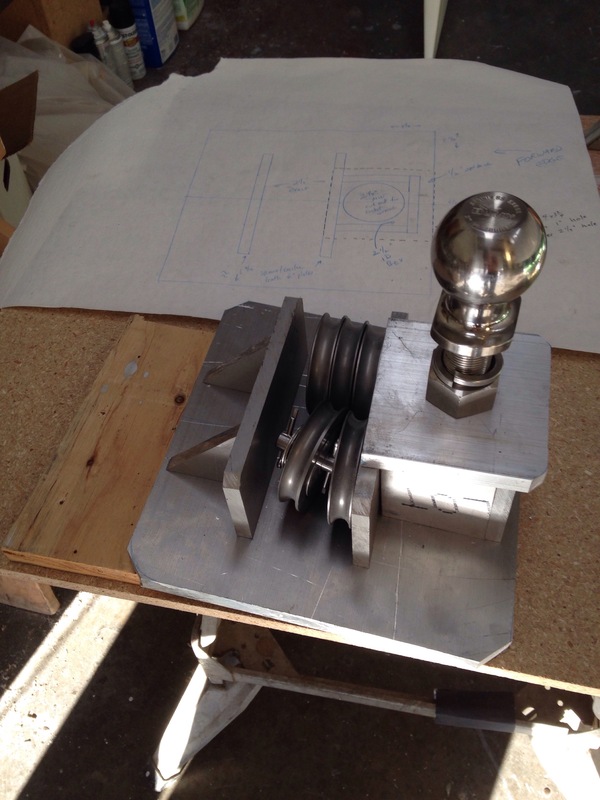 The rotator cup looked built on to an end plate. 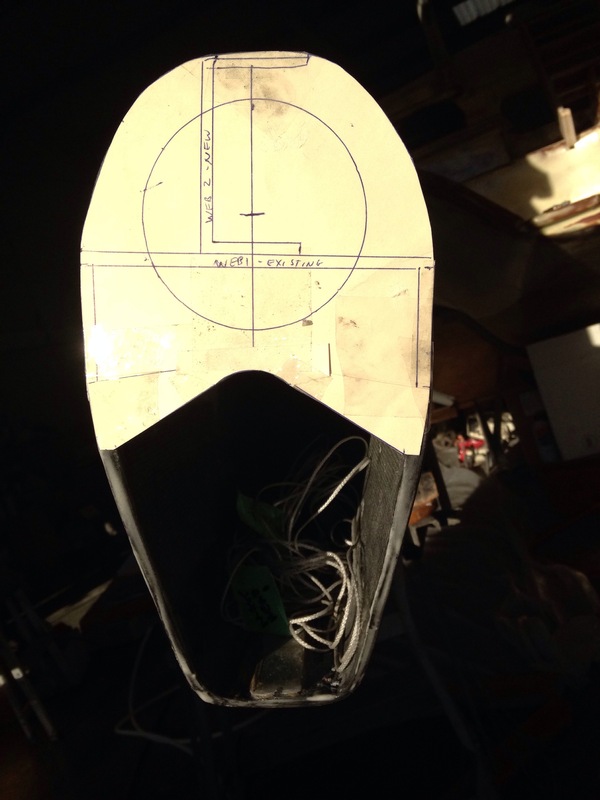 And the next day Keith at Skateaway Design laid out our plan to add one more fore/aft web inside the last foot of mast, then cap the bottom and affix the new steel cup to that cap. All the compression downforces will then be shared through both the forward walls of the mast and a Tee structure inside. This cardboard mockup shows the internal webs underneath via blue ink. 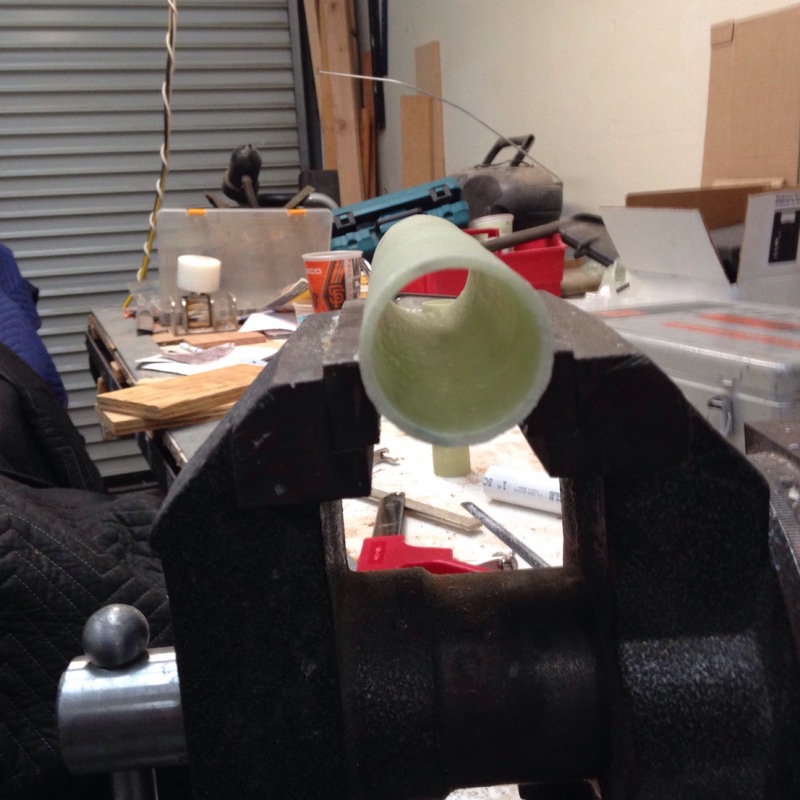 The cap was made by laminating a dozen layers of 12oz under vacuum on the work table. 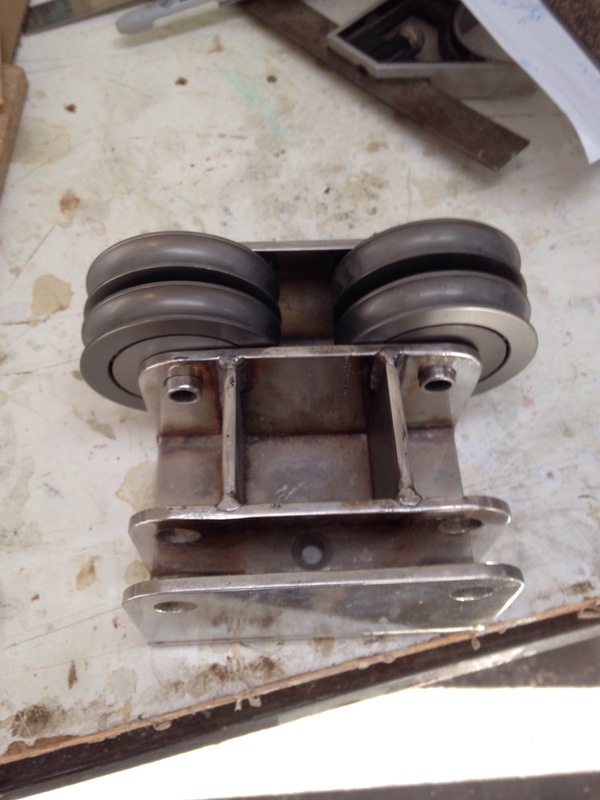 The cup has bolt head recesses cut inside – the backing nuts will be entombed after the cap is bonded on so we will secure them thoroughly. 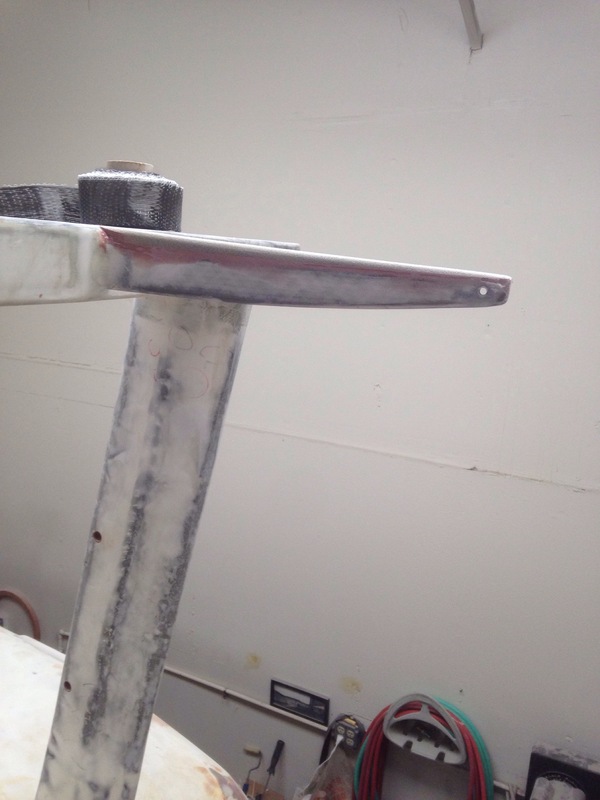 Now we’re waiting for a piece of aluminum channel to make that final web inside the mast. The new gooseneck position was drilled and tapped today. 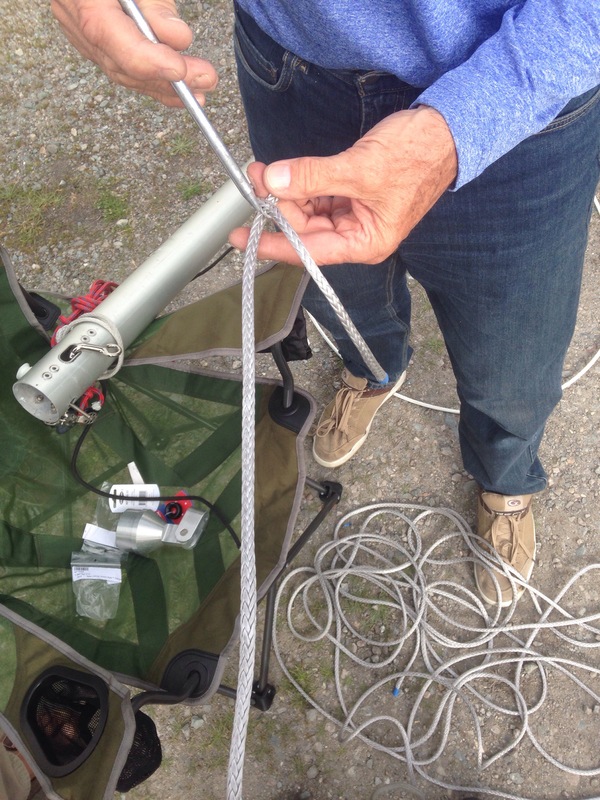 Goose visited yesterday and worried how we’d get that backing plate 31″ up inside the mast. 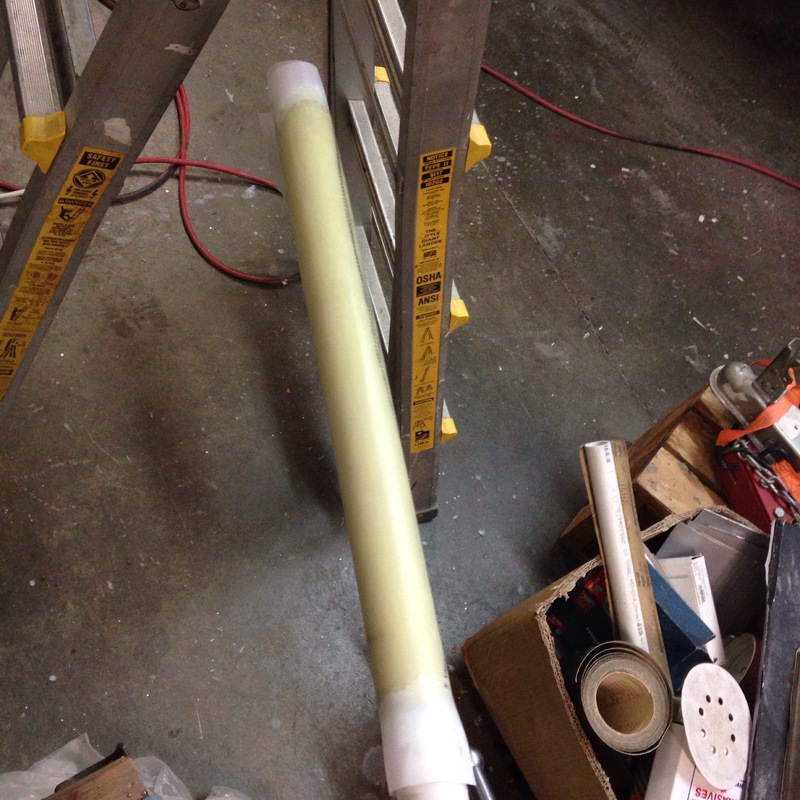 It got slathered with high density putty and hand placed about 28″ in, and slid the last inches with a pusher stick. 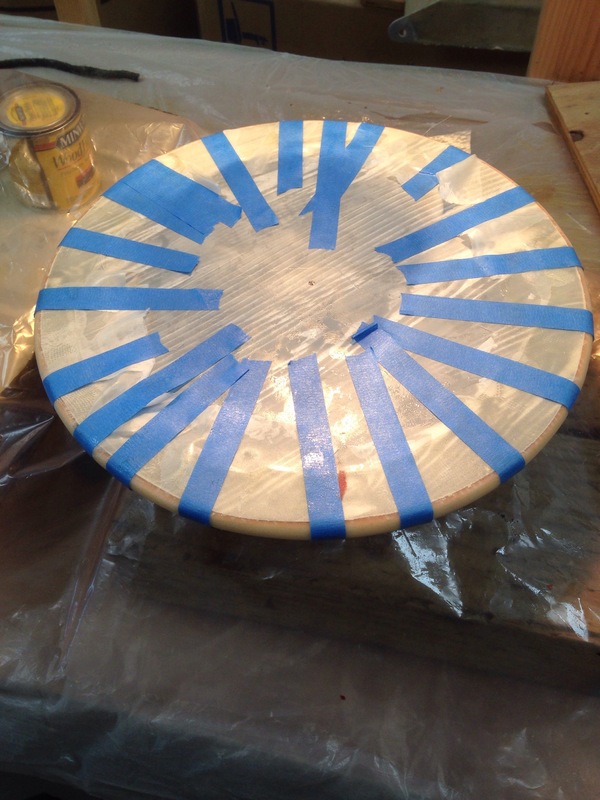 Careful repeated tapping set the plate down in the epoxy putty mix and it bonded well overnight. 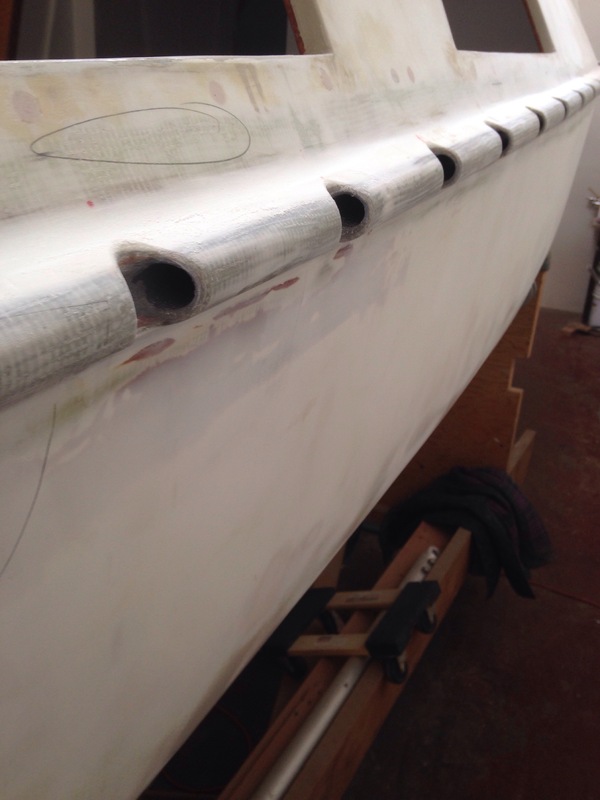 This morning the mast was flipped back over and the thread tapping for 8 bolts went in fine. To beef up the last two feet (spread the load a bit above the 12″ internal webs, we added one more spiral wrap of 5oz tape and 28″ more of 6oz longitudinal uni. Above the gooseneck area the mast is now complete so the painting progressed well this week. 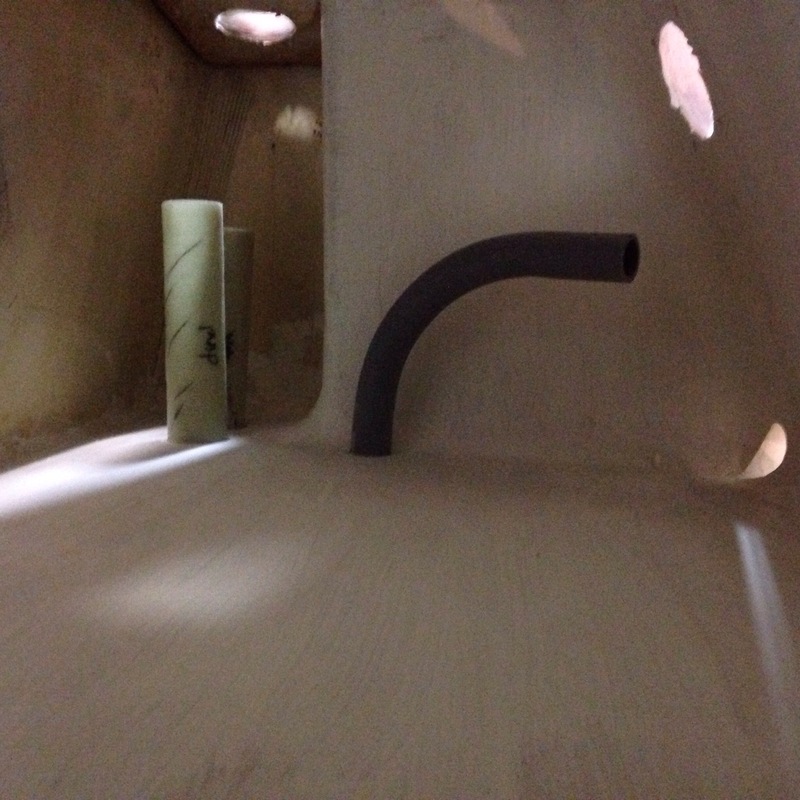 It’s done in Interlux Platinum color – same as the beams last month. This has been good learning of the roll & tip method, and more importantly how imperfect fairing or priming shows through. If the surface isn’t perfect before painting, the paint ‘ain’t gonna hide it, but rather it accentuates the blemishes. And yesterday we learned that trying to work all angles vs gravity is tricky, as in painting around the whole mast at once. The face that was pointing up looks great (those photos above), but what had been facing the floor ended up with some paint blotches and runs. 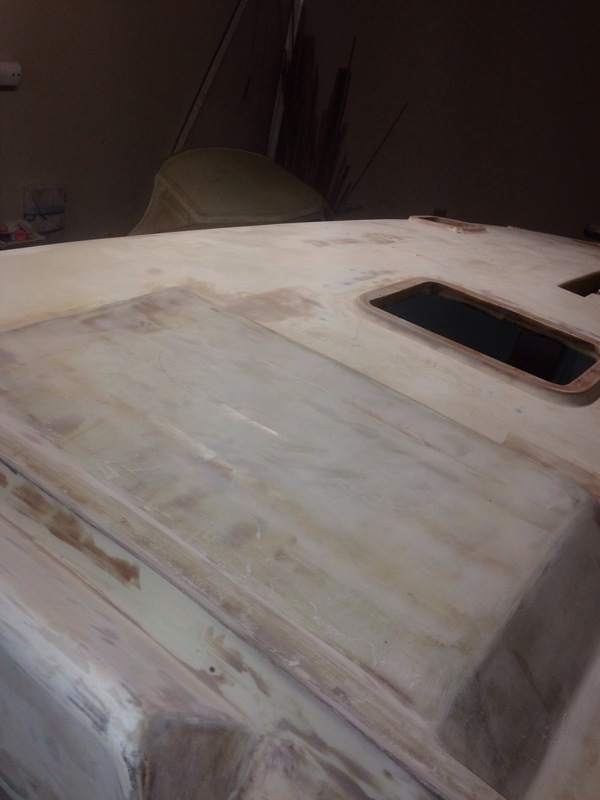 Pretty frustrating tonight to be sanding away money and causing repaint work tomorrow. 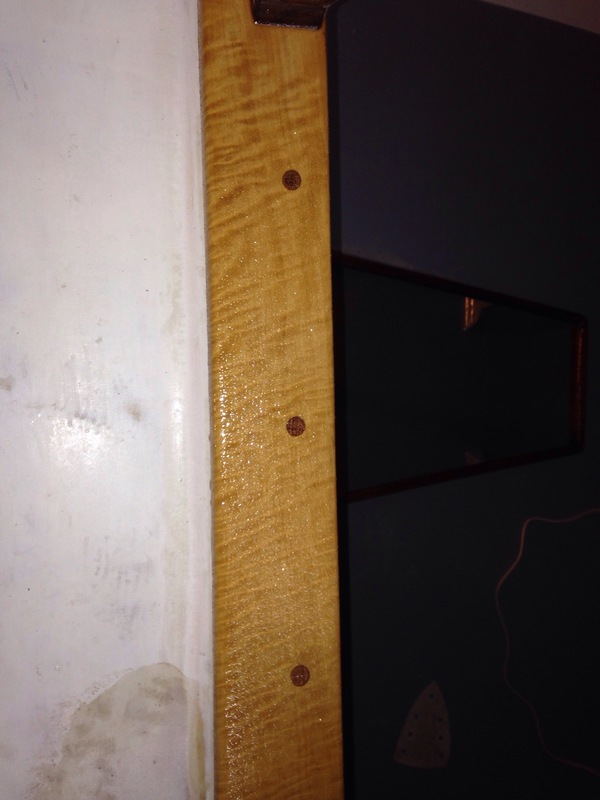 See the after-wet-sanding spots from tonight. 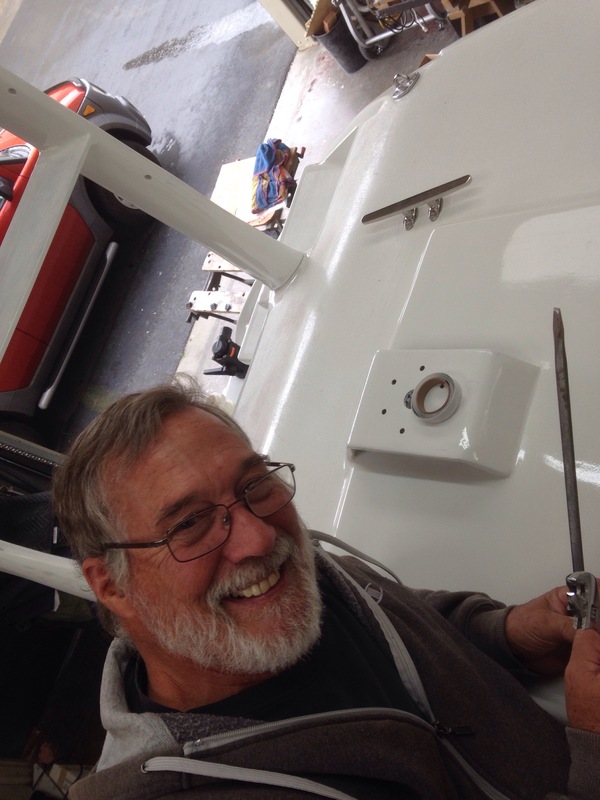 With the mast almost done we made it back to the main hull today, and thanks to Charlie’s loaned right angle drill finally tackled the awful access job of boring five big 5/8″ holes in the forestay bulkhead to receive that chainplate. 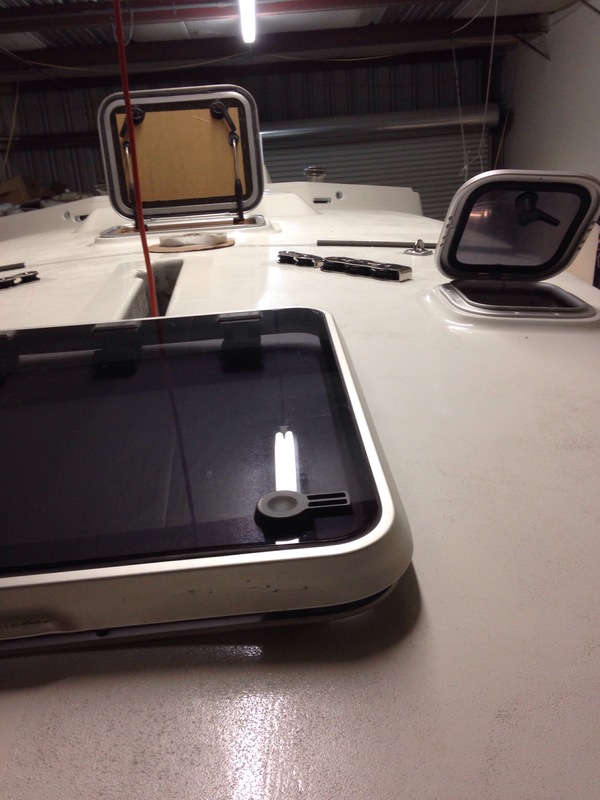 Colligo Marine took our specs and custom cut the chainplate in titanium. 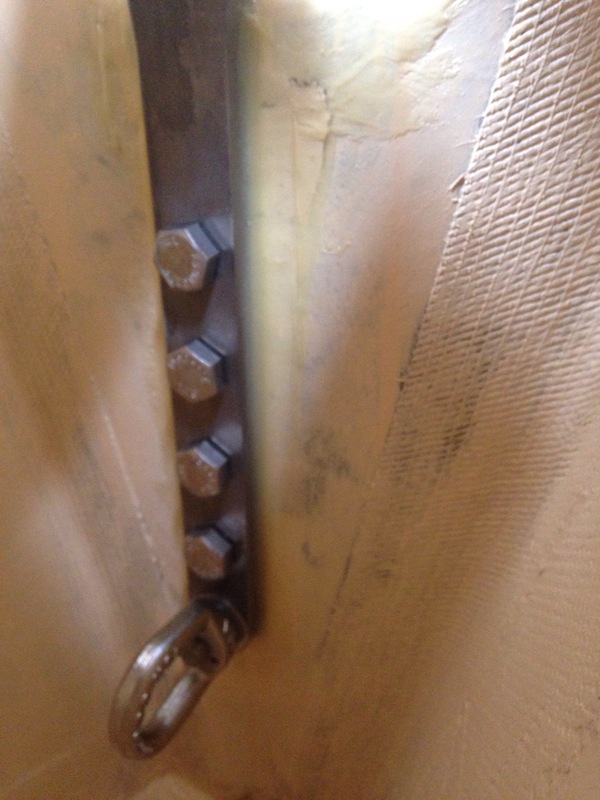 Thank you Guy Stevens for challenging me how we’d inspect and/or replace a stainless steel chainplate since it’s getting permanently bonded in place. The titanium is going in to this “forever” spot instead. It was over 90 degrees up in this corner of the shop, with really bad angles for the installer’s knees, etc. After many foul words uttered and about an hour and a half all holes were lined up and the plate successfully dry fitted. 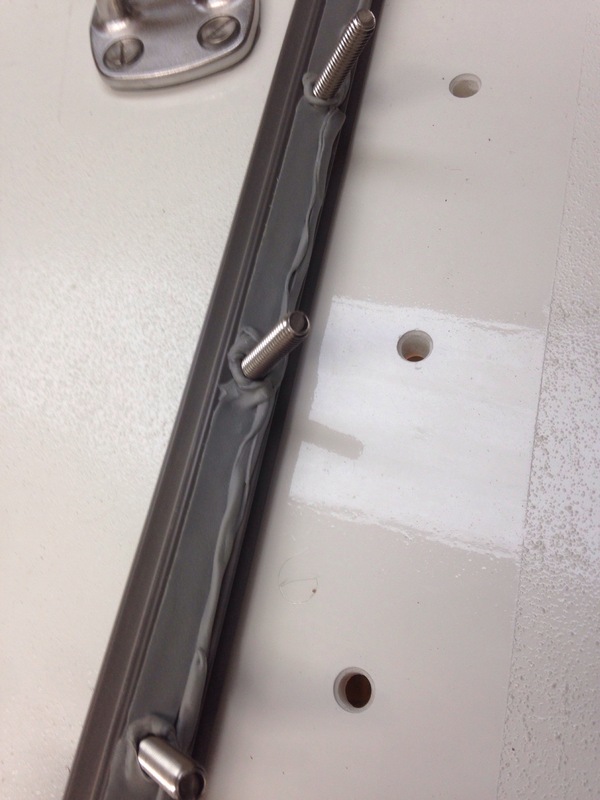 It’ll get bonded in once the right bolts arrive.